The Rick Steves Best of Venice, Florence & Rome tour begins with Venice's timeless St. Mark's Square and Basilica, then on to Michelangelo's stunning David and the Uffizi Gallery in Florence, and ends with Rome's ancient Forum, Colosseum, Pantheon, Vatican Museums, and Sistine Chapel. You'll also enjoy guided neighborhood walks, memorable meals, and full-bodied Italian wines. Italy's three greatest cities are like fine gelato — why settle for just one flavor if you can get three scoops at once? Join us for the Best of Venice, Florence & Rome in 10 Days! Enjoy the Christmas season in Italy! We'll meet at 4 p.m. at our Venice hotel, deeply nestled amidst the canals, bridges, and alleyways of this magical, preserved-in-amber city. After introductions, we'll set off on an orientation walk, and then enjoy getting acquainted over a traditional Venetian dinner together. Sleep in Venice (3 nights). No bus. Walking: light. Our local guide will join us this morning for a historical walking tour, with a modern Venetian's-eye view, through the backstreets of Venice, ending in St. Mark's Square and the shimmering, mosaic-filled Basilica. Along the way, we'll learn about the city's remarkable past and its challenging future. The afternoon and evening are free to explore the imposing Doge's Palace, maybe take in a church concert, waltz on St. Mark's Square, or pub-crawl your way through this unique city. No bus. Walking: strenuous. This morning we'll have our first real brush with the Renaissance — Venetian-style — with a tour of the Accademia's treasure trove of great Venetian art, starring Titian, Veronese, Bellini, Tintoretto…and every shade of color imaginable. Then it's all aboard for a cruise into Venice's lagoon on our private boat. We'll visit your guide's favorite island, where you'll have free time to explore and enjoy lunch on your own. After returning, the evening is yours to discover Venice's other famous sights, or to become happily lost in the tangled maze of alleys and shops. Tonight your guide will help organize a classic, romantic gondola ride for those who are interested. Boat: 1 hour. No bus. Walking: moderate. We'll drive straight to Florence this morning, and hit the ground walking with a Renaissance tour of the city's historic center. We'll learn about Brunelleschi's magnificent cathedral dome, Ghiberti's Baptistery doors, and other creations that helped define this world-changing era. Tonight we'll share a hearty Tuscan dinner together. Sleep in Florence (3 nights). Boat: ½ hour. Bus: 4 hours. Walking: moderate. A local scholar will join us this morning as we take a walking tour of the backstreets of Florence, with some fascinating peeks into Roman, medieval, and 19th-century Florentine life along the way. After exploring the Palazzo Davanzati, we'll continue our tour across the river, where we'll create today's tasty lunch during a fun and informative cooking class. Your afternoon will be free to see more of the city's museums. No bus. Walking: strenuous. This morning we'll devote our time to the breathtaking Renaissance art of the Uffizi — home to the finest collection of Italian paintings anywhere — including works by Leonardo, Botticelli, Michelangelo, and more. After some free time to make your own Florentine discoveries, we'll gather again this evening at the Accademia Gallery to marvel at the power of Michelangelo's rough-hewn Prisoners and his greatest masterpiece, David. No bus. Walking: moderate. This morning we'll drive into the rolling hills of Umbria, stopping for a wine tasting lunch at a family-run winery. We'll then make a bee-line for Rome, where we'll take a neighborhood orientation walk on our way to tonight's dinner together. We'll end our day as any good Roman would — with a stroll through the historic heart of the city, lacing together the classy Piazza Navona, Trevi Fountain, and the remarkably preserved, 2,000-year-old Pantheon. Sleep in Rome (3 nights). Bus: 4 hours. Walking: moderate. Today we'll focus on Renaissance (Catholic) Rome. At the sprawling Vatican Museums, we'll visit what seems like a limitless collection of treasures as you make your way to one of the world's most famous works of art: Michelangelo's Sistine Chapel. We'll then be introduced to the greatest church in Christendom, the awe-inspiring St. Peter's Basilica, home to Michelangelo's sublime Pietà. The rest of your day is free to wander through this immense church and explore more of the Eternal City on your own. No bus. Walking: strenuous. We'll spend our morning uncovering ancient Rome, starting with a tour of multi-layered San Clemente — a 12th-century church sitting atop a fourth-century basilica and a previous Roman temple. Then we'll tour and hear vivid tales of the larger-than-life Colosseum and the birthplace of ancient Rome: the Forum. You'll be free this afternoon to wander through the nearby Palatine ruins, St. Peter-in-Chains Church (home to Michelangelo's Moses), or climb to the top of the Victor Emmanuel Monument to enjoy a panoramic city view. Tonight we'll feast together at our farewell dinner, sharing travel memories and toasting new friends. Salute! No bus. Walking: strenuous. Breakfast is provided, but there are no group activities today. It's a breeze to reach Rome's airports by taxi or train. Your guide will help you with any post-tour planning, leaving you well prepared for the road ahead. Arrivederci! After orientation and transportation lessons, be able to navigate cities on your own. This was my third Rick Steves tour and it was very enjoyable. I am looking forward to the next one. "The winery tour was a nice touch." "The whole tour groups cooking class." First experience with Rick Steve's and in Italy and it was wonderful. Our guide Karin was wonderful. Exceeded our expectations. We are 72 and it was exhausting for us. Lots of walking and stairs. We saw everything we expected to see and the guides were very detailed and wonderful. All hotels were very good. All connections worked well. No complaints. "The Vatican was fantastic. Tours and guides were very good. Amazing site." This was our first time with a tour group and it more than met our expectations. The group dynamic was comfortable, we made friends that we will continue to see stateside. Gelato Having the expert local guides take you through the various sites and museums significantly increased our understanding and enjoyment. Amatriciana The balance of structured group activity and free time felt just right. Gelato The hotels fit the feel of the tour perfectly. Karin was spectacular. "Francesca's tour of the Colosseum and Roman Forum was spectacular. All of the guides did a good job of making the sites relatable and helped bring what you were looking at to life. Francesca was several cuts above." I was invited to go on this tour with my Daughter and Son-in-Law. They are experienced travelers. I am not so much. I did the solo room thing at extra expense, but it was worth it. Overall, I was as prepared and informed in advance as Rick Steves could get me from; information, guides, accommodations, packing my stuff, sites, transportation, food, scheduling appointments and tickets to events, etc. I can't imagine any Europe tour being better than this one! "Venice, Florence and Rome all had equally exceptional and unique qualities. The whole thing was great." This was my wife and I's first Rick Steves tour. It was our first time to Europe. We had an amazing time in Italy. The motels were local authentic Italy experience with really good breakfasts. Our tour guide Anna was wonderful. She helped us experience Italy in a very fun and unique way. My wife and I enjoyed the smaller group experience. "The wine tasting in Umbria with its views, tour, and overall experience was amazing." Great trip. Really enjoyed it. "Venice overall. Much brighter, cleaner. Busy, walkable city. Boat trip to Burano and Torcella." This was my first time traveling to Europe and first time on a tour. It was a wonderful experience! It was great staying at hotels which were close to city centers so we walked just about everywhere! I loved having all the details taken care of -tickets to museums,tours,transportation between cities all arranged for us. Local tour guides were amazing-so knowledgeable. I enjoyed having free time as well to explore each city. Highly recommend this tour! "There were a number of "wow" moments but the tour of the Colosseum and Forum definitely was very impressive and one of the top events of the tour!" I have been waiting 20 years to see Italy! As an art history teacher, the museums were a highlight for me as well as experiencing the sense of place in which the creation of these amazing works took place. It was like a dream come true. "Michelangelo's ceiling in the Sistine Chapel....except for the hundreds of other people. I really wanted to just stare at it and contemplate in silence which is really not possible. but it was still the high point for me." Outstanding tour and we will be back for another. Hotels and food provided were excellent. (I gained weight and am now dieting.) Had plenty of time to see the sights we wanted to check on our own. Ann Long was terrific at keeping us moving at a good pace and ensuring we had what we needed. The step on guides were top-notch., especially Francesca in Rome and Alaria in Vatican City. "Wine tasting on the way to Rome. The setting, the wine the food and the hospitality were worthy of a couple Michelin stars." All aspects of the tour exceeded my expectations! Of course, all three cities were fabulous. But, our guide, Ann, was outstanding also. She created a positive, fun, and safe experience for all of us. I had a great experience as a solo traveler. It was easy and fun to get to know the other tour members. But, there was also plenty of time to do my own thing and recharge for the next group outing. I will definitely book more European tours through Rick Steves' Tours! "There were so many but I think the Coliseum and Vatican Museums were tops overall. I was enchanted by St Mark's in Venice, enamored by the Uffizi in Florence, and amazed by St Clements in Rome. My favorite time with a "local" was at the winery in Umbria. It was all overwhelming in a good way. I definitely see why people return to Italy again and again - there is so much to see, absorb, learn, and experience." All the tour sites were amazing. The tour was well planned and very detailed and the ease of getting into the different venues were easy. The planning of having the tickets bought before we got there and watching the events of the day to change a schedule to better fit the tour was amazing. Mrs. Anna was very well informed and organized. She helped us plan extras and gave plenty of information to fill our free time. One day we had a very hard to understand. "I really loved the age of Rome. My wow moment happened over and over with each bit of information that they shared and the history and age of the ruins." This was R.S.tour #3 for us, and my favourite. Everything came together and "clicked". My wife gave a detailed analysis,so i will keep it brief. "Wandering the backstreets of Venice." First I need to mention Martin, he made our first trip to Europe, in fact our first Tour ever, memorable. When I think of any location we went to, I hear Martin telling us the history and any other fact he could think of. We met a wonderful Group of new friends on this vacation, and even if we never see them again, they are a large part of our memories of Italy. We very much appreciated how the Tour was setup so we saw the most important Paintings or locations, not everything. "David. Awesome and amazing! I came to Italy to see the Colleseum, and would've loved to have spent all day there, but very much appreciated the full day of seeing and learning about many of the ruins and paintings. But other than all of the above, the first glimpse of the inside of the Sistine Chapel was awe inspiring and had to pinch myself that I was actually there. The Tour of the Winery was memorable and the 3 bottle of Tuscany wine made it home safe!" "There were many "wow" moments for both of us, but we will choose one each. For Jim, it was seeing the ancient temple dedicated to Mithras at the San Clemente church in Rome, evidence of pre-Christian beliefs. For Kathryn, it was seeing the "Botticelli Primavera" and "Birth of Venus" paintings in Florence; the paintings were breathtaking in person and the allegories told a story that could be contemplated endlessly." Wow! The tour was well-planned with a nice balance of activities and personal time. The other tour members were all friendly and welcoming. The meals that were provided were excellent and the guides were outstanding. This was definitely a tour that I would recommend to anyone. "There were a lot of "Wow" moments, some of them planned and some of them serendipitous. Seeing the statue of David for the first time was definitely a moving experience. My first ride on a water taxi in Venice was delightful. And people-watchng throughout Italy was a never-ending source of pleasure. What a lovely country!" This was our fourth RS tour. We had visited Venice, Florence and Rome for a couple days each on a previous tour. We decided to take this tour to be able to delve deeper into each city - and the tour was perfect for that. As always, there was a nice balance between group activities and free time. Once again I was blown away by how much I learned from the local guides, particularly in the museums. "The 2 hours spent with Elizabetta in the Accademia in Venice was the best 2 hours I have ever spent in a museum. I could have listened to her all day. Prior to the tour we read a book about Brunelleschi's dome and its construction, so climbing it at sunset was a highlight. Also really enjoyed the stunning golden mosaics in the church on Torcello." This was my first trip with a tour group. This specific trip had been recommended by my brother-in-law who traveled to Italy on the March Rick Steves' trip last year. I greatly appreciated all the logistical arrangements and orientation to each city and to the outstanding museums by the respective local guides. I found that having other people with whom to visit and share life experiences enhanced travel. The hotels were strategically located in central areas facilitating exploring on foot. "Although there were many spectacular experiences, my favorite was seeing the many canals and architecturally beautiful buildings from many different perspectives - from sidewalks, bridges, vaporetti and from tower observation points on both sides of the Grand Canal." Excellent, excellent, excellent ! I have always wanted to stay in Venice for a few days. Years ago I was part of a tour that did the "day tripper", slam bam visit to Venice and I felt cheated. "Climbing to the Palatine overlooking the Forum. Awesome." I'm really not good at surveys. critiquing things. Thoroughly enjoyed the tour. "Not applicable. There were way too many "wow" moments to choose." Well organized, excellent tour host in Daniela, excellent hotels-transportation-accommodations, safe and secure. "Sistine Chapel, vatican Museums, St Peters Basilica"
The 'Strenuous Activity Level" should be taken seriously. I had difficulty keeping up with group on evening city orientation strolls. Seemed more like a forced march. Both overall guide and local tour guides extremely knowledgeable. Loved the overall cultural experience more than museum tours. "Finding our hotel the first night in Venice at midnight (or later) after 20 hours of plane flights and airport layovers when city was completely deserted, shop windows shuttered with graffiti, litter from evening celebrations in streets, vague directions, and not being familiar with street (alley) signage. Wondered what 3rd rate slum tour we'd gotten ourselves into. Then seeing vibrant crowded city the next morning when shops opened, streets full of people, GREAT COFFEE. It all made sense." I had an amazing time. I appreciate the tour even more now that I reflect at home. Very strenuous but I needed the exercise! "Didn't register that Venice has no cars or bikes until we left." Our tour was very well run. I never felt rushed at any location, never leaving a location or a city wishing we had spent more time there. The amount of time spent at each location was perfect, and I really liked the mix of structured and free time. "My favorite wow moment was in Florence, in the Accademia Gallery, when I saw Michelangelo's David for the first time. I had heard of it and seen pictures of it for many years, but seeing it with my own eyes, seeing its size and beauty, was stunning." The tour was excellently executed. Daniela is priceless, an expert and knowledge tour leader. The local guides were also excellent. I have traveled with three other tour companies and find The Rick Steves tour a cut above the rest. Can't say enough about how wonderful the trip was. "Venice and the Grand Canal view for the first time." It was an exceptional, outstanding tour with plenty of structured activities and just enough free, roaming time to our own devices and imagination. "I realized wow we were really doing this tour when we arrived late in Italy due to an air controller strike and had to negotiate our way to our hotel through customs, the bus and the vaporetta taxi to the waterstop and to the hotel over the Rialto bridge in the darkness arriving at just before midnight. The directions given by the Steves tour group before we left the US was perfect." "The view from our hotel in Florence! We had a beautiful view of the Duomo!" This was an amazing trip that I enjoyed very much. I'm just now going back through all my pictures and videos and am in awe about how much we did. Loved it! "Moving my eyes forward only inches away from 15th and 16th century paintings and seeing the brush strokes and fine details. Similarly, moving in close and seeing the chisel marks on unfinished marble sculptures. It's almost like the artists were just taking a break. You don't see that in books. I also loved the craftpersons in the small shops... the sisters that build gondolas, and the small shop creating mosaics. The lunch on the hillside at the winery / olive farm was memorable!" The tour was the perfect mix of activity to rest time. The guides were extremely knowledgeable but not boring. Nina is a gem! "Seeing Rome at night with all the lights. Being able to touch a column or brick that had been touched by people living over 1000 years ago." We had such a great time! Each city (Venice, Florence and Rome) brought something so unique to our trip. Traveling and getting around was seamless. Our fellow travelers in the group were all such a joy to get to know. The level of professionalism was second to none. I would consider traveling with Rick Steve's again. "As we walked to St. Marks Square in Venice a heavy fog had engulfed the square. It was Venice Carnival. People were walking in period costumes and being festive. We chose to dress up and experience this magical celebration through the mask like the Venitians did long ago. So glad we did. It was a magical experience." "Too many "art wows" made it one largish wow. A moment that seemed to encapsulate both Italy and the Rick Steves approach was a museum on a square in Venice that turned out to be a hospital, and our tour guide's local hospital, at that. Living history, indeed. Modern mosaic master visit was very impressive, and the preponderance of interactions with local residents was positive, clearly due to their previous experiences with Steves Tours and friendly relations with tour and local guides." This was my first Rick Steve's tour. It was extremely interesting, well organized, and fun. All of our guides were exceptional both in their knowledge and clarity. I really enjoyed the people on our tour as they added a lot to the experience. I felt like we were given a wonderful overview of our cities in Italy as well as the culture. "It is very hard to pin down just one. I think for me, as an artist myself, I loved meeting the Italian Mosaic artist in Florence. It was so unexpected to be able to see the studio and the work in progress. I cried. I was amazed at the David museum as well. As many times as I have seen images, there is nothing like seeing it in person. I also cried. The Church with the different levels of history in Rome was absolutely fascinating." Overall, the tour was overwhelming with so many sights to see and so much information to take in during such a short time. Our tour guide was extremely knowledgeable and was quick to share her life-long passion with tour group members. The size (25) of the tour was just right and allowed everyone to get to know one another and share the joys of our travels. "I was really surprised by the vastness of the Rome colliseum and also of the view from Palantine hill of the overall Roman complex." I really enjoyed the tour experience. I have toured a few times on my own with Rick Steves books had a blast. But it was nice to sit back and let the professionals take care of all the tours and hotel accommodations, and they nailed it. "For me the whole tour turned out to be a wow. But what really stood out was the extra things that were planned that I would have never done on my own." The tour was amazing. I didn't realize how close I would feel at the end to my fellow travelers or how much I would miss them when we all went home. It's been two weeks and I still think of Italy and miss it and want to go back. I would recommend an RS tour to anyone! I also lost a couple pounds due to all the walking, so that was splendid! "Seeing the inside of St Mark's Church - all that gold and detail -- wow!! I was amazing. Venice was so...crazy and I got lost so many times, but the history of that place is insane!" I took this Rick Steves' tour with my husband and my parents. We all had an amazing experience that I know we'll cherish for the future to come. I had been to Europe before, but my husband had not. We were all amazed about the amount of history and culture packed into the small streets of Italy. Basically, history built upon history built upon history. It's one thing to read about but once you arrive and take it all in, it's breathtaking. "The moment we climbed down into the bowels of San Clemente al Laterano to see how 3 churches had been built in the same spot, one upon the other, was an amazing "wow" moment for me. Realizing that individual places all through Rome and the rest of Italy have more history and story than the entire country we came from!" The trip was life changing and amazing, words cannot describe how happy we were on this incredible 10 day journey. My wife, my son and I found this trip to be such a great vacation. Nina was outstanding and we cannot say enough about her passion and care of our tour group. She was always on time, clear and provided incredible facts and stories in every location. She is a jewel for your team, priceless!! We are recommending this trip to everyone we know and that its such a life changing trip! "our WOW moment was being in Rome and the David sculpture, the passion and depth of emotion in that piece of art, you cannot help but get emotional when just admiring it from both up close and far." This was my first time going to Italy. I was a bit nervous as I was a solo travel at just 18 years old, but Rick Steve's tours helped to take care of the heavy work for me by making reservations and taking care of our hotels and dinners so that I could see the best of Venice, Florence, and Rome. My tour guide Nina was amazing as an American Expat who has been living in Italy for 22 years she is very knowledgable about Italy and it's culture and I would definitely recommend her. "There were so many "wow" moments on this tour but it is hard to pick exactly one. If I had to I would definitely pick the Colosseum in Rome. For years ever since I was a child I had dreamed of seeing the Colosseum and walking into the place where Gladiators would fight and to marvel at the amazing architecture of the Colosseum. When I was first saw it I said to myself "Wow! It looks so much bigger in person!" The Colosseum was my first Seven Wonder of the World." Everything about the tour was great (except for coming down with a cold). We chose February for Italy to avoid the crowds. The weather was fine (nippy, but it was winter after all), and the lines were short. This was our fourth Rick Steves tour, and the thing that I noticed this time was how well-curated it was. Our overall guide, Tina, was fantastic, as were all of the local guides. But the local guides brought a sense of structure to the experience. "Unexpectedly walking into the pope's apartments and seeing Raphael's School of Athens. I was speechless." We have for years planned our European trips, using RS guidebooks. But going to Venice, Florence, and Rome with all of the art, history, and museums, we thought it best to go on a 'real' RS tour. We were thrilled with our decision. The trip exceeded our highest expectations in every regard from accommodations to dining, from guide to tours, from sites to experiences. It was top-shelf. "Too many to mention, but one of the 'wow' moments was walking to the top of Brunelleschi's Duomo in Florence. Part way up, you come to a glassed-in cat-walk, high above the sanctuary floor, giving a stunning view of the sanctuary below and Brunelleschi's dome above (how did he ever accomplish this in the 1400s). Finishing the climb, there was breath-taking view of Florence at the top of the dome." "There were so many of these: Michelangelo's David The Sistine Chapel The wine experience at Orvieto The cooking class in Florence The gondola ride in Venice And two things we did on the day before we met up with the group in Venice: A performance of Vivaldi's Four Seasons in a church A visit to the Peggy Guggenheim collection"
Well planned and perfectly executed. Tour Guide is a reflection of your tours. Tina is fantastic and makes the tour very personable! She planned mine and a fellow traveler's birthday celebrations during the tour. Hotels were perfectly located and convenient to many of the sights and local stores and restaurants. "My WOW moment was birthday celebration at lunch and the Gondola ride with the serenade music was out of this world. Tina was so thoughtful to include the musicians on the Gondola ride." This was our fourth Rick Steeves tour and it turned out just like the others. We had a spectacular time even though we picked up colds in Venice. "There were lots of them, but walking in on "School of Athens" at the Vatican was right up there." The experience my family and I had was one in which we will remember for a life time. Our tour guild,Tina was the reason we had such a wonderful time. Her knowledge of the history to her tips on local good eats,gave us the feel of being like one of the locals. During our tour,there were two birthdays and my son asking his girlfriend for her hand in marriage,Tina went out of her way to celebrate each event in unforgettable ways. Tina at the end had 28 strangers feel like family. Kudos to her! "So many to just point to one,but if I must, are time in Rome and having Illary(sp) give our tour of the Vatican and the Roman ruins was excellent." Great trip. No surprises. Everything was "as advertised" so we were very pleased. "Our favorite "wow" moment was a gondola ride in Venice. It was my wife's birthday and our guide, Tina, set up a gondola with a singer. Awesome!" I loved this tour. The pacing was perfect, the guidance was outstanding. My true only issues stemmed from a few tour members. Venice was simply a beautiful city with unique and wonderful surrounding islands that just enhanced how interesting the history is of Venice to me. Florence was a city I thought I would enjoy a great deal more than I truly did. Rome was just a home away from home for me. Top to bottom I LOVED Rome. "I would have to say being guided through Basilica di San Clemente, The Colosseum, and The Forum by Francesca was my wow moment. For someone that has studied ancient Rome most of my life she was able to show me and teach me things I did not know. I almost cried walking into The Colosseum because I was just overwhelmed by the moment and feel. I was able to close my eyes and hear the noises of the crowds echoing through the centuries." This was my first trip abroad, and Italy has always been on my wishlist for travel destinations. I'm so glad I took the leap and ventured on this unforgettable trip. I was uncertain of this type of touring which was listed as 'strenuous', this is a vacation. But I was pleasantly surprised, after acclimating to standing out in the cold/damp conditions for long stretches. I would definitely do additional tours with Rick Steves. "It's impossible to list 'a' wow moment; I had several. The culmination of architecture, artwork and scenery makes it impossible to claim; I had many wow moments; a trip of a lifetime." The tour of each city was more than I expected. It was more than a tour, it was an enriching experience. It filled my senses with sights and sounds and tastes I had never experienced before. We had a wonderful cooperative and friendly group, a generous group leader, and exceptionably knowledgeable Italian tour guides. I am still processing all that I experienced on this trip, emotionally and intellectually. "Michaelangelo's David in the Florence's Athenee Museum was one of many wow moments. I felt in the presence of Michaelangelo himself. The ability to get so close to this masterpiece and walk around him at 360 degrees was a magical moment I will never forget." The Rick Steves' "boot camp" approach got us up every morning at 6am, on the road by 7:30 and into a grand locale, most often a museum or church, before 8:30AM. Strenuous and wearing but getting-into-shape inducing, we saw and learned more than I could have imagined. I had thought of myself as well-versed in the Renaissance, but the outstanding guides enlisted by Sarah and the Rick Steves organization, added a very thick layer to my level of knowledge. "The "David" -- stunning and breathtaking and surpassing by far my expectations. To add, enjoyed immensely the stop at the Umbrian vineyard -- our mentor and the winetasting lunch became part of the beauty of our surroundings; and our dinner together our first night in Rome -- the singing and the food were great fun." The tour was more than I could have ever expected it to be. I am a fairly confident traveler and the tour and learning the Rick Steves' way helped me become even more so. I am admittedly a hotel snob (Diamond with Hilton) and I found the hotels to be perfectly located, comfortable, charming and staffed with excellent people. The bus was excellent - I loved that it had WiFi which allowed me to catch up on some items from home that needed attention. All of the local guides were exceptional. "This is a question that people have asked me since I returned home, and to be very honest, I cannot narrow it down to just one "wow" moment. There were many moments for me - the Trevi Fountain, David, a gondola ride in Venice - getting lost in Venice. The Basilica of San Clemente was probably the biggest surprise. Falling in love with Italy is probably the biggest wow moment. And knowing that I will be back very soon." The chance to visit Italy again with my love, on this same tour, was even better than the first time - and I had no idea it could be better! Every detail is considered and cared for, making the experience one of being fully present - nothing to worry about or figure out, except for what you want to do on your own time and where to eat, and eat, and eat!! We made the most of every moment, even when happily exhausted we had to stop at just one more pub for one last glass of wine! "Visiting Burano, seeing the colorful rows of homes and businesses along the canals, the simplicity of the island with it's equally beautiful and impressive architecture made me smile all day. AND visiting Harry's Bar in Venice, enjoying the original bellini was a really special moment, such a fun afternoon!" Still appreciate the balance of planned and free time. Gave us time to explore more or rest as needed. ""wows" are difficult to express. Walking into churches and being amazed at all the wonderful art every where. It was lovely to find myself in Venice for a second time. i very much enjoyed see all the layers of Rome under the church of San Clemente." I had a very fine time on this, my first guided tour. Great cities, great art, great weather -- and what seemed a pretty much flawless tour, logistically. Thinking back, I liked our "first nights" the best -- walking tours to acquaint us with each city, then good food and wine at dinner. I give all credit to Karin and also want to applaud my tour mates for their affability, patience and good humor. Thanksgiving at home has nothing on spritzes in Italy. "We happened to be near Trajan's Column in Rome at sunset and looked up to see thousands of starlings swirling and then dropping to roost in the tall umbrella pines. The streetlights were on and there was a violinist playing. Very special and I have it on video." We saw a lot in a short period of time. Really, it takes a while for it all to sink in. I enjoyed the walking and the pace of events. The free time was about right. The local guides made things come alive in a way that guidebooks and recordings cannot. Karin was most accommodating and informative - and a good shepherd for her flock. Now I completely understand Rick Steves' remark in his shows about needing more time to take it in. "I completely enjoyed the tours of the 3 cities. But for me, the view of Orvieto from the winery stop. That is the moment I realized that what I would really like to do is go on another tour of the smaller towns and villages in Italy. Seeing it from afar makes you want to head over for a look. Then, I realized that there is a whole country out there that we were buzzing by as we toured Venice, Florence, and Rome. Personally, I am much more comfortable in the countryside than in the cities." "Karin and the local guides picked all the best sights for us and I liked that we could stay in the days' museums if we wanted." This was our 3rd Rick Steves tour and again we enjoyed ourselves immensely. The organization of the tour was excellent and we felt the group bonded well. "We had been to both Venice and Rome before - certainly revisiting all the sites was wonderful and the architecture dating back so many years is amazing. My "wow" moment was really a "wow" experience - I loved the cooking class we had in Florence. It was fun, entertaining, and got different members of the group working together. And the meal afterwards was delicious. This was a great thing to do with the group. The trip to the winery in Oliveto was really enjoyable as well." The tour was an excellent balance of guided tours and time to explore on our own. The organization of our tour guide and the history and insights from the local guides clearly made this trip so very worthwhile for us. I had made long lists for each city of sites that I had hoped to see. Of course, I wasn't able to see everything on the lists, but we came close. On the flip side, however, we saw unexpected sites and experiences that were exciting surprises due to the expertise of our guides. "I can't answer this question because there were so many. The first was approaching Marco Polo Airport and seeing from the sky that Venice is indeed shaped like a fish! From then on it was a series of "wow" moments and experiences. Admittedly, I had spent two months studying the Rick Steves guidebooks and my art history books so that I could extract the most from the trip." This was a great trip! It was just enough organized group time along with free time. The group meals were excellent. The winery that we visited was a nice stop in between Florence and Rome. We had a cooking class which was great fun as was the visit to a local artist and her studio. The weather cooperated for the most part. Karin is a terrific guide! This was my first Rick Steves trip and it won't be my last! "San Clemente church, Colosseum, Burano, Sistine Chapel, Palatine ruins, Duomo.....there are too many things to list!" Best of Everything! I have never been on a "tour" (always have made my own arrangements, etc.) so I was a little concerned that I would find an "organized" tour too constrictive. Not at all! In fact, I found myself wishing I had done one of the Rick Steves tours before as I no doubt missed a lot when relying on my own knowledge of what and where I visited. From the very beginning everything was seamless - no wasted time but no rushing. "I'm not sure I can limit it to one. How about a "WOW" for each city? Venice: first getting on the Vaporetto and slowly motoring our way to our stop. What an experience - of course I knew there were canals, but to actually experience them is another story. Florence: walking at night and experiencing the grandeur of the Duomo and Baptistry; and the David...pictures DO NOT tell all! Rome: the Vatican and watching a Papal Mass on the jumbo trons and been blessed by Pope Francis from the window"
The tour with Lisa Anderson, Orin Dubrow and our local guides exceeded my expectations in the best ways; educational, beautiful and fun! And as my first trip out of the USA, Lisa and Orin made me feel confident to venture out on my own during free time. It was a great balance between structure and free time! I highly recommend the Rick Steves tours! "Experiencing the Italian culture with Lisa Anderson, Orin Dubrow, the local guides and the people I met had the greatest impact on me. I recognized something so unexpectedly familiar, an influence from my childhood, as a first generation Italian-American, that I didn't realize until now. I feel a need to know and travel more!" My daughter and I thought we would share great experiences together on a tour like this...we had a memorable and wonderful trip together! No time for much relaxing though...very rigorous...But we saw and experienced as much of Italy as we could in the time we had. I couldn't have hoped for a better guide than Lisa(Orin as well)...they were just great. We were exhausted, but so glad we signed up! "I loved the wine tasting and lunch near Orvietto...and a good rest day for me(much needed!)" This is a joint evaluation from Marty and LuAnn. The Best of Venice, Florence and Rome tour went well beyond our expectations as our first time group tour. If there is a better tour guide than Lisa (with Orin assisting)we would be surprised. The tour hit all the major tourist sites at all three cities as advertised. The three hotels were all in the heart of the key areas of each city and they were all clean and comfortable. We virtually never waited in line anywhere. "We arrived in Venice by train after a one-day side tour of the Proseco region with Oriana Balliana. Walking out of the train station in Venice and seeing the Grand Canal for the first time was a definite "Wow" moment. Beautiful buildings on the canal with every type of boat criss-crossing in front of us. And we were able to take a short vaporetto (bus boat) trip down the Grand Canal to our first hotel which was about 100 yards from the Rialto Mercato boat stop." Schedule was great in starting with breakfast at the hotel then walking to museums, churches and nearby piazzas with occasional rests to get a coffee and restroom break. Buddy check system was helpful and expedient. Most afternoons one is free to dream, explore and discover on their own. Group dinners together were lovely. This is an active tour with a lot of walking, come prepared with the right shoes and mindset. "I loved visiting the very special winery in Orvieto. The hills, landscape and buildings were beautiful in driving through Orvieto to get to Tenuta Le Velette - our bus driver, Antonio did a great job maneuvering the winding roads. They spoiled us with delicious wines, tarts, cheeses, meats and desserts. We even got to visit the wine cellar, our host was charming!" First Rick Steve's tour. Did not know what to expect. Lisa went above and beyond. I was most impressed that she had enthusiasm for someone who has done this many times before. Very informative. "Wow moment. Probably the quieter times when on our own visited the gardens in Florence and Rome." Having never been to Europe before I was a little intimidated by everything there was to see. So it was so nice to have all our lodging taken care of as well as all the most popular attractions planned out for us. But we still had plenty of time to go out and explore on our own. It was the perfect mix. And our tour guide Lisa was so great. She was very kind and knowledgable. She always had suggestions for what to do in our free time, and wanted us to experience the culture. "I think my favorite wow moment was seeing the statue of David by Michelangelo. It was something you've seen in pictures everywhere, and Lisa really built up the suspense beforehand. She had nice talks with us about the history of the artwork and the artist. So to finally see the masterpiece in person, towering over you, was really amazing." "Perhaps one thing that does stand out was attending the cooking class in Florence. Extremely enjoyable and a nice experience. Also enjoyed the visit to the winery." Had a great time on our tour. The experience was well organized and thoughtfully planned out. We hit all of the best sights to see and got a great amount of information that was not only educational, but also about the culture and day to day living for Italians. Loved our tour guide and the local tour guides as well. "Walking through the Gladiators' Tunnel entrance at the Colosseum and getting to stand on the Arena was amazing. The perspective we had was unique and special and it was so cool to be able to do that." Rainer was our guide, and he is quite amazing. He knows so much, plus he makes outings fun. The local guides added a lot to the outings. Honestly, Elizaveta bombarded me with a lot of facts in too short a period of time, but she was amusing to watch. The rest were all amazing. The final thing I want to comment on is the nice balance between group time and free time. Not experienced with tours, I now realize this balance is actually very important to me. "The four horses in St. Marks Cathedral. Powerful, powerful." My wife and I had a wonderful experience on our recent RSE trip to Italy. It was our first experience with an organized tour group so we weren't sure what to expect. And we weren't disappointed! There was a nice balance between scheduled activities and free time to explore on your own. It was a nice benefit to have certain activities pre-planned and prepaid for us such as the special group Colosseum tour in Rome. "My "wow" moment occurred while visiting the Roman Forum. While walking on the same path that Julius Caesar walked some 2000 plus years ago, I couldn't help but wonder how such a developed society could decline and then eventually be pillaged by invading forces. It made me appreciate what our current civilized society has accomplished. I am now concerned that the same destructive forces could occur again destroying the knowledge and scientific breakthroughs that we now take for granted." I really enjoyed our guide, Rainer and all of the local guides. I got so much more out of the tours of the museums because of their knowledge and enthusiasm. I also loved the winery tasting and lunch as well as the cooking class. Both were a nice break from the intense museums and were so much fun! I was impressed also with Rainer's ability to adapt to the aqua alta issues we encountered in Venice. "Well it is hard to top the Sistine Chapel, but the gondola ride was pretty fabulous." We have previously visited Europe on our own. This was our first European trip with a tour group. We wanted to go with the best - Rick Steves Europe - and we were not disappointed. While we read and studied about the three locations we would be visiting, we learned so much more while on the trip - which greatly enhanced the travel experience. Italy is an amazing country! "I can't pick just one moment - there were so many - especially the ancient historical sites! The visit to the winery was a highlight - the beautiful country side, the location, history of the buildings, and the beautiful chapel. So calm and peaceful!!" A friend recommended the Best of VFR tour, and we knew it was going to be a good time. Our experience on the tour far exceeded our expectations in every way, and we can't wait to come back. "I loved every minute of Venice and Florence, but Rome blew my mind. Local guide Francesca Caruso helped me connect to Rome on an emotional level, and her storytelling drew my into the details of Roman life." Wonderful experience. Proper balance of guided tour and free time. "Can't pin down a particular. It was all GREAT. Winery experience was best of I were pushed." Nice balance of scheduled/guided outings and free time to do what we desired. "Seeing the statue of David." Our tour experience was great! It was my husband and my first Rick Steves' tour and we were not sure how we would like it. We loved it. Our tour group was awesome and our tour guide Patricia made the tour so fun, informative and easy!! "Had many WOW moments! All the spectacular views, Vatican Museum, Sistine Chapel, Vineyard in Ovieto, Cooking school, David, Uffizi etc..."
It was great immersive experience. It was physically exhilarating, mentally enriching and so much fun! It reignited a desire and confidence for international travel. The tour exceeded all expectations. "I think my "wow" moment was when I realized all we had visited, who we met and all the skills I gained or revived to travel abroad, again." "The gondola ride in Venice was really great as we got a singer who was outstanding. We probably couldn't have done that on our own. Also, we had a singer in a restaurant in Rome, which was also a highlight. Getting into the attractions without waiting in line was a big plus, and although we might have been able to do some of that by going to a local guide, I think we were better off with Rick Steves." We thoroughly enjoyed our Rick Steves tour of Venice, Florence and Rome. This was our first group tour and we were surprisingly pleased with the whole experience. Our tour guide, Patricia,was wonderful. She kept us informed and entertained the entire trip. "There are so many WOW moments on this tour. Each city has its own personality and highlights but the most magical moment was the gondola ride Patricia arranged with a fabulous singer and a musician; his beautiful voice echoing off the narrow streets of Venice just as the lights began to turn on. A great memory." Everything I expected and then some. Well managed agenda for the entire 10 day trip. "For me it was turning the corner and seeing David. To me, it is unbelievable the talent fo Michaelangelo. The Sistine Chapel ceiling was another "Wow" moment, again the talent of Michaelangelo. Another "wow" moment was Leonardo da Vinci's Codex Leicester. I was extremely fascinated by the hand writing and "brain power" of da Vinci." Patricia, our tour guide, did a fantastic job of making our first Rick Steves tour a great experience! "The WOW moment was when we realized interacting with other members made the trip even more fantastic! Everyone was friendly and there for the same reason we were!" We had a wonderful experience and our expectations were exceeded on a daily basis. Our guide, Patricia, enhanced our tour beyond measure. She's a very good historian, exceedingly funny, a fast thinker and great problem solver, an she seemed to care deeply about everyone in th group. "Our first night on the tour was in Venice, the day of the epic flood. Our guide, Patricia, was able to re-book the entire group into an alternate restaurant the cause our original restaurant was flooded. She turned what could have been a disastrous evening into a big party. That set the tone for the entire tour"
We had an amazing time in Italy! Everything was so well organized. The transitions from activity to activity were smooth and seamless for us. Our Tour Guide possesed endless energy, humour and positivity. The accommodations were great and located walking distance to all the main sites. Lovely,full breakfast buffets with outstanding Italian coffee specialties!All of the group dinners were in wonderful local establishments and simply delicious. Behind the lines access to sites is great! "The private boat tour to the islands of Barano and Torcello! Barano is the most beautiful and colorful place I have ever seen yet it is a local community and not just a tourist stop. The lace making is so incredible! Amazing seafood - just loved it!" My first RS tour experience was so positive it essentially left me wanting more. I was truly sad to leave Italy and new friends. I am already planning my next tour for 2019 and hoping to bring my daughter along for a college graduation gift! Every aspect of the Venice/Florence/Rome trip was well organized, fun and educational. It was really rewarding to be among the interesting tour members as well as benefit from the high level of professionalism of the guides---all first rate! THANK YOU! "This is an impossible question for me, personally, to answer, so I will give a brief overview list of "best of best" of an ALL BEST trip: 1. Boat Ride to outer Islands in the Venice Lagoon 2. Circling the DAVID statue in Florence, which cannot be described with human words... 3. Sunset panorama view of Rome on top of Victor Emmanuel Monument...Perfetto! 4. Our DELICIOUS cooking lesson in Florence(Ciao, Fabrizio!) 5. Our stop at Le Velette winery--spectacular! 6. ALL. OUR. GUIDES. WOW!" Great tour guide - made the experience. Enjoyed the local guides at each site - very informative. Headsets were wonderful idea. Hotels were adequate with possible exception of Venice where was really bare bones. Having time to explore by ourselves was good. Visit to winery was wonderful and buses were modern and comfortable. Three days at each site was just enough. Overall, a better experience than I expected. Everything was very well organized. We saw the best art, sculptures, frescos, churches, etc., in the world! The Tuscany wine tasting ,cooking class, gondola rides, water taxi to Burano, etc., was a perfect break from all the museums and churches. Our brains needed it. The 'free' afternoons were good too. Very good balance! The walking was intense some days but our group tackled the feat...no complaining among us. My husband even lost weight despite all the delicious food. "Seeing Michaelangelo's David and the Sistine Chapel... The hit of our trip!" We thoroughly enjoyed our first tour five years ago and it's safe to say our second tour was every bit as enjoyable as the first! Weather was an issue from the first day but Patricia was well-prepared and put everyone at ease with her experience and sense of humor. We really liked how this tour only had 2 long bus rides and more time in the major cities. The group meals were excellent, lodging was good, and the local guides were exceptional. We had a great time! "Seeing Michelangelo's David was my "wow" moment and the experience would not have been the same without the excellent background and context from the guides." I have dreams of visiting Italy one day, when I watched Rick Steves shows. Didn't think it would come true, but it has. What an experienced it was. There are so much to see, do, peoples and places. Thanks to my niece Joanna's, she make my dream come true. Thank you! "My WOW moments are: St. Mark's Square and the roof top view in Venice. 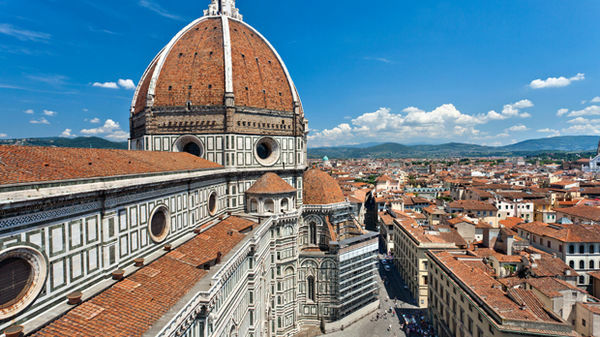 Climb the magnificent cathedral dome and cooking class in Florence. Walk into Basilica S. Pietro, Musei Vatican's, Colosseo in Rome and many more. I would not be able to experiences all of these, if it wasn't Rick Steves tour. I would definitely recommend to my families and friends." Great tour! All major attractions covered. Tour runs like a well oiled machine. I definitely got what I paid for. "I went to Italy mainly to see the Statue of David, and it was everything I hoped it would be. St. Mark's Basilica was also stunning. I had not expected to be so taken by the first moment inside the Basilica! It is such a moving experience to be in such places." Italy was more wonderful than I ever imagined. We loved Venice with the grandeur of St. Mark's, charming neighborhoods, fabulous bridges, and the canals. Florence impressed us with the fabulous art in so many forms, sculpture, paintings, churches, and the David. Cooking Class, Winery Tour, and Rome! The fountains, the Colosseum, the Sistine Chapel! Tina, our guide, was knowledgeable, caring, and arranged everything perfectly in spite of some rain! Plenty of time for sights, food and rest! "Seeing Venice's Grand Canal and the little neighborhood canals with charming bridges scattered throughout this beautiful city with stunning architecture was better than anything we saw in the movies!" Very well organized and run trip. Our guide Tina was outstanding in her knowledge and attention to detail. We are grateful to her and the behind the scenes work to pull off a great trip. "Climbing the Duomo. An amazing architectural accomplishment that has now stood 600 years." Our tour experience was priceless and it was all due to one person, our guide Tina Hiti! Despite the constant barrage of foul weather phenomena Tina was able to keep our group on schedule and smiling about the amount of water we had to deal with! She gave us an Italian experience we will not soon forget. Our group was full of happy, motivated people who just wanted to get out and see Italy despite the weather, we had a wonderful time and will continue to use Rick Steves for our European travel. "Standing on the Balcony of St. Marks watching the seawater start bubbling up through the drains and knowing how high the water would eventually get, and at the same time realizing that this is just a way of life the Venetians have adapted to over the years..."
I had a positive experience as noted in comments below. Excellent trip! "Rooftop view of Venice on the first night of tour." Tina was delightful. She sparkles! Tina made the tour the best that it could possibly be despite all the rain and the flooding in Venice. She is a ray of sunshine. The other tour guides were passionate about what they did. Everything I did and I saw just took my breath away. "The experiences - the art studio, the wine experience, and the meal preparation with the chef." Having spent 28 years in the Navy, "touring" per se has been in my blood. Aside from that as a record industry executive, I have toured many countries and cities that I would have not had the chance to do so. All that said, this was my first RS tour and it goes to say that it was an "adventure" all to itself. The people I met both inside the tour group and as part of the hosts were great. "Besides the statue of David, the cooking class with Fabrizio. Besides fun, we all learned something and the food was perfect. Fantastic Orvieto wine experience. (asked my wife if she'd like to move there...) And last but not least - Catarina Balletti (amazing)." I typically do not respond to surveys, but some people performed at such a high level that they deserve the recognition. This was an outstanding tour which did an excellent job of melding art, history, food, and urban/countryside! Tina was a fabulous guide who made all of us feel comfortable. She was excellent at problem-solving on the spot (e.g. when we were on the front end of flooding in Venice) and moved our gondola rides to the day before so we were not disappointed. She provided extra surprises along the way on our walking tours as well. The art/history scholar tour guides were all outstanding! "This is a tough question. Probably going into the Colosseum was the one moment, but also being in Venice as it began to flood was an historic moment which helped me (and all of us) truly understand what it is to be Venetician. Finally the vistas from the Umbrian visit took my breath away." The tour was wonderful- exactly what I had hoped. A great mix of organized tours and plenty of free time. Our tour guide was like the most knowledgeable, helpful friend possible. We quickly fell in love with Tina . I can't imagine anyone providing a better travel experience. We had an "adventure tour" - thanks to a lot of water:) Everyone rolled with the punches and made so many great memories together. Even during our free times we tended to join one another for meals, etc. Highly recommend! "Being in St Peters Basilica and hearing the Italian choir sing in English during mass. One of my favorite worship songs. An almost surreal experience. Seeing "David" was so special. So many experiences were dreams come true." This tour was a fourtieth wedding anniversary gift to ourselves and we had an absolutely wonderful time! We enjoyed everything about it including the itinerary, our guide Tina Hiti, our fellow tour members, the little daily surprises, our hotels, the restaurants, our local guides, and just the right amount of free time. We can't pick just one outstanding aspect or moment and there was not one thing that we thought was a let down. We can't wait for our next tour! "This is a tough one. For me, being a history and architecture buff, I was blown away by the moment I walked into and looked up at the domes at St. Peter's Basilica and the Pantheon. For Carole, it was entering the Colosseum through the gladiator's tunnel, looking up at the entire spectacle, and thinking what it must have felt like 2,000 years ago. What a special treat our tour coordinators arranged for us!!!" For a first time traveler, any other travel will have to go a long way to beat this experience. Perhaps this was kismet, but our traveling companions were a marvel. "We caught a procession in Florence. Just a glimpse of something that's happened over and over again(minus people snapping selfies). My daughter and I attended a delightful performance of I Musici Veneziano. A French family sat in the two rows ahead of us, parents, aunt, and four stair-stepped daughters. The opera singers played to the children in the audience, much to their enchantment. The next day in Burano, we rounded a corner and there was the same French family. How sweet!" Well organized tour. Team building was a good start, getting to know each others name and a little bit about each person important start. Buddy system worked well to keep track of each other. The choice of places, museums, etc. we visited was well thought out and efficient. Having some rest periods each day was important, too, and also time for our own exploring. Hotel accommodations comfortable and their breakfast was well done for all three hotels. "Sistine Chapel was a highlight as well as Michelangelo's David Sculpture. All three towns, Venice, Florence and Rome had spectacular art and architecture. It was well presented by Stacy, our tour guide." This was my first visit to Europe and I was impressed how smoothly everything went on the group tour. From the moment we arrived at the hotel until being dropped off at the airport our guide set the expectations, provided insights on the tour events while being available for any questions. The tour was a nice blend of the sites, group activities and free time to stroll off to see other venues. It was a wonderful first trip to Europe and had a great time in Italy. "I had a couple - arriving in Venice via the water taxi as the city is so different than anything I have experienced. It was beautiful and an awesome site. The 2nd was walking into the collosseum in Rome as we got to walk in from the alley of death. It was amazing to see and take in the history of a place that had such importance so many years ago." Oh man...what to say. From my first steps in Venice to my last in Rome, the trip was beyond expectations. Between the beauty of the sights and the superb guidance of Stacy, I was able to live the experience I was looking for. "That one is easy...Being rained on through the oculus at the Pantheon." We have used Rick Steves guide books for years for traveling on our own. This tour was an awesome experience. It was our first Rick Steves tour and we were so impressed with the way the tour was organized, allowing us to have the benefit of a group tour with an outstanding guide and local experts, while also allowing us to have enough time to wander around and explore on our own. It was the perfect introduction to Italy. "The first night of our tour in Venice, our guide changed the itinerary due to concern about the weather, and took us for gondolier rides. We had a singer and guitar player and it was a full moon. It was magical, and a great way to start the tour!" I arrived in Venice several days before the tour started, and stayed in Rome several days after it ended, enabling me to see more sights and experience the cities at my own pace. This is easier for a retiree, but I'd recommend it for anyone who can take the time. I have taken several other guided trips overseas, as well as a good deal of independent travel. You do a better job and offer a better value than any other guided tour I've taken. "Probably two: (1) Rounding a corner to see the Duomo of Florence looming in front of me, and (2) Walking into Rome's Colosseum "onstage" at ground level (which made me want to make a speech!)." Loved every minute of the trip. The tour itself was incredible, but I must say, the very best part was meeting our wonderful fellow travelers of like-minded people. ... Big props to Stacy for the great job she did of leading us, educating us, and making the trip go smoothly. We'll definitely do Rick Steves tours again in the future! "Oh, no you don't. I couldn't possibly narrow down to one a trip filled from start to finish with "wow" moments." There were a few problems going on that we didn't even know about as Stacy and the local guides worked out in the background. There was a one day strike in Florence but they worked our tour around so we still went to every planned place but maybe at a different time or day. Stacy did a splendid job and the local guides she worked with were very knowledgeable. She added a stop at a military cemetery on the way from Florence to Rome and that was a great thing. "Seeing the inside of the coliseum at the ground level and looking up to see all the people up in the top of the stands." This tour was so much fun! The group really did become a family, watching out for each other and poking fun at one another, (speaking as the baby of the group). I really liked the balance of tour time to ensure that we saw the must see exhibits early before the crowds AND free time to explore on our own. Stacy really made it a priority to ensure that everyone felt included and on track so that we could pack as much into the short amount of time. "The gondola ride the first night in Venice really made the entire trip and set the tone. I couldn't imagine doing it the last day and thought it was the perfect introductory to Venice and Italy." how do I begin? Stacy, Wonderful leader. Even thing ran smoothly and the weather was perfect, we were so blessed, the rain gods were with us. "the coliseum among many others"
I thoroughly enjoyed the tour and Stacy as our guide. It was just the right amount of time spent as a group and free time to go out and see things on our own. Having a travel buddy is a really good idea to ensure our group stayed together. I would highly recommend this tour of three fabulous Italian cities. "Arriving in Venice and leaving the airport via water taxi. Then later after joining up with our tour group going out for a gondola ride and being serenaded." It was obvious the trip was well planned and came off with precision. Everything went as I anticipated. Not used to large tour groups, I was a bit concerned about having 24 or 25 different people to interact with. However, everyone was very pleasant, cooperative, and interesting when engaged in conversation. It was nice to have a mixed age group and most all were able to keep up the pace. "Having been to all 3 cities before I cannot say I had a " wow" moment but I saw and learned things I hadn't known about previously, which is the reason I enjoy traveling. The trip to the small island off the tip of Venice was a treat. The visit to the olive farm and vineyard was quite enjoyable and nice to interact with Italians." tours and sites were great. dinners were set up very well. Hotels were disappointing as there wasn't any communal lobby space to sit and talk at 2 of the three hotels. We are fairly experienced travelers. We signed up for our first group so as to be sure to see 'the sights', without long lines, etc. It met that goal. An additional, unexpected benefit for me was the wonderful guides we had at Vatican and Uffizi (Paolo and, I think, Marco), who added tremendously to the experience in their discussions of the Renaissance and what we were seeing. Give them a raise. I also greatly enjoyed the afternoon with Marco at his Olive/Grape farm in Umbria. "Explanations of art in Uffizi and Vatican and how they characterized the Renaissance, what the Renaissance meant at the time and what this art means to us today. Their passion for the subjects was wonderful." Great tour guide. Great local guides. Group got along very well. Lots of interesting and wondrous sights and tons of insights and information about the cities and the artwork. I do not believe I can capture all my thoughts and feelings about the trip in 500 characters :-) I can say it was exemplary from start to finish. I have wanted to see Italy for 50 years (no joke) and I am so very grateful I chose RS Tours for this first experience. "There are SO many! The first is my first sight of St Mark's square in the evening; the second was the Uffizi; third was the Colosseum; fourth was the David sculpture; fifth was sunset in Florence from Piazzale Michelangelo; sixth was the view from the top of St Peter's Basilica; seventh was the interior of St Mark's Basilica(especially the four horses sculptures); eighth was the Pieta. I could go on....."
This was my first Rick Steves Tour and I've already recommended it to several friends and family members. I was pleased with the hotel accommodations, the group meals, and the local tours. All guides were fantastic, professional, and added incredible insight to the experience. "Walking into the Boticelli room in the Uffizi and seeing those beautiful paintings that I had only seen in textbooks from school." Our first trip of this type and to Europe. Tour was well organized. The information on history, culture and art was all excellent. We began the days early and the pace was brisk. Brisk to the point that when the organized part of tour day was over a break was in order. We squeezed a lot in every day. The benefit is that the tour was as comprehensive as possible seeing a cross section of pertinent sights. "I believe the information from the guides was crucial to the benefit of our trip. St. Peter's Cathedral was exquisite. In Venice, St. Marks Cathedral and Doge's Palace were highlights. Gondola ride was fun. Walking tours with narration of history and culture was important to value of trip. In Florence again walking tours with focus on history and culture were valuable. The renowned sculpture was impressive. In Rome it was a balance of seeing the Vatican and Ancient Rome. Both were impressive." Excellent overall experience. The Rick Steves' Organization (RSO) chose a great itinerary of places of interest, hotels and restaurants for a ten (10) day excursion. The tour was also a very good mix of structured events and free time so that there was some decompression in between the sights. The group was a very good mix of couples and individuals with varied background. I think that 25 to 28 person is a good group size for this tour. "In Florence at the Michelangelo Park, watching the sunset and listening to a guitarist playing music, very nice." This was my first Rick Steve's tour, or any tour for that matter, and I was so pleasantly surprised! I did not know what to expect and was so happy with the experience. The tour guide and local guides were amazing as were the itineraries and most of the accommodations. "There are so many to count! My top two "wow" moments would have to be the trip we took to Orvieto to Cecilia's winery and the tour of ancient Rome. Both were truly great experiences! Our local guide in ancient Rome had such passion for her city that it was contagious. Loved seeing the excavations under San Clemente church." This was our fourth Rick Steves Tour and we are planning another next year. We enjoy the system you use for your tours, such as staying in small hotels and time for our own interests, and have found your guide books to be the best. "Lunch at Caffe Florian in St. Mark's Square in Venice, looking out at the Basilica and listening to the orchestras playing. I love those bronze horses. I also enjoyed the archaelogical dig site at St Clement's Church in Rome. I was impressed at how they were able to clearly show how Rome builds on top of its past." I wanted to visit and have an introduction to the "big three" cities in Italy and this tour certainly accomplished that! Our tour leader (Marijan) was superb, the group members were pleasant, and even the weather cooperated. "Oh my...hard to pick just one! Thoroughly enjoyed the first journey on the Grand Canal in Venice, then walking over the Rialto Bridge. While the Uffizi in Florence was terrific, the Galileo Museum was fascinating. Francesca, our amazing tour guide in Rome, brought new insights into understanding ancient Rome in a way that was unique and she provided a major mind shift in being able to take more of a perspective of a Roman so many centuries ago." 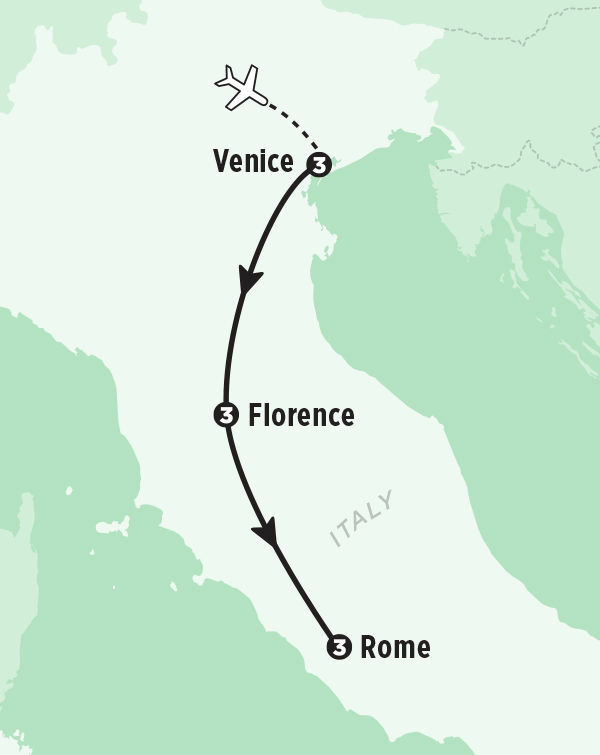 I chose this Venice,Florence & Rome tour as I wanted the benefit of a fully guided Rick Steves' tour for these cities. It did not disappoint! All of these cities with the history, art,ancient architecture,culture were fantastic. What made it so much more, was the exceptional care and information given by our wonderful guide Marijan Kriskovic, and also the local guides from each city. I really enjoyed the wine tasting we were treated to in Umbria, on our excursion to Rome. "There are really too many "wow" moments on this tour. I really enjoyed finally getting to tour The Doge's Palace and cross the Bridge of Sighs. My first trip to Venice, many years ago,the Doge's Palace was closed due to damage from flooding. I was so upset as it was what I really wanted to see. SO glad,our RS tour wasn't affected by flooding that Venice experienced just a week after we left! Florence was my favorite city.Beautiful! The Uffizi,Santa Croce,David,& BEST food!" I really liked the way you programmed seeing the major sites as a group, and then leaving a good bit of free time for us to do/see things on our own. Local guides were fantastic! "Seeing again after 40-some years the Basilica of S. Giovanni in Laterano (done on our own)." Very enjoyable. Great mix of tour time and free time. Very informative and fun. We were tired towards the end but I think thats a good thing. We saw everything we wanted to see but most importantly we learned so much while seeing sites. The guides made everything so easy. One of my favorite parts was actually the drive from town to town on the bus... in particular stopping for wine tasting between Florence and Rome. The farm was incredible. "My wow moment was the tour guide in Rome, who walked us through St. Clement basilica, the colosseum and the forum. She was amazing in her tone and knowledge - had us so engaged and had most of us in tears during the last part of our visit at St. Clements Basilica. Wow. I never thought I'd ever feel so connected to someone living 2000 years ago." A once-in-a-lifetime experience. So much shoehorned into a ten-day itinerary but thoroughly enjoyable. Wonderful guides, places, food. People should know this tour is VERY walking-intensive and some older travelers struggled. I STRONGLY suggest to those of you with no fitness program to TRAIN beforehand by walking an hour a day. I'M NOT KIDDING! We averaged 22,000 steps a day and on the days we were on the bus we still did 12-13,000. We ate like kings and I still lost 8 lbs! "- Santa Maria Assunta church, Torcello - 1,000 y/o frescoes and mosaics - Colosseum and forum area. - St. Marks Basilica and Doge's Palace, Venice - Statue of David in Florence - The Vatican and of course Sistine Chapel - Basilica di St. Clemente, Rome: A 15th century church built on an 8th century church built on an old Roman house. The best thing about these places were the wonderful guides who brought each place to life for us." Amazing and well organized. I especially loved the little side trips like the cooking class and vineyard. Marijan, our guide, was so helpful and amiable. His little treats and stories and a good sense of humor made the trip even more memorable. The local tour guides were wonderful and each gave a unique perspective and were excellent in conveying the connection of the past to the present and most importantly to the future. "There were so many. Everytime I thought I experienced the highlight of the trip another site or experience would amaze me. Some of my favorite moments Venice: The basilica on Torcello, Rialto market, Aperol Spritz and cicchetti, the top of the Campanile (Bell Tower), lighting of St. Mark Basilica. Florence: Luca, Palazza Davanzati, cooking school, David, Giglio Rosso. Rome: Marco, Poggio Della Valara, wild boar sausage, Trattoria Der Pallaro, MariaLauer?, Francesca, San Clemente, the Forum"
We had a wonderful time! The tour was fast-paced and filled with information. We enjoyed exploring each city with our guide and group. We felt like we got to see everything we wanted and more. We loved having time on our own to explore the cities, and we felt like we were equipped to do so due to our wonderful guide Marijan. "My favorite "wow" moment was during our walking tour of the Coliseum and of the Forum when our local guide explained how the Romans built all of the things they did as they did not have a good understanding of the afterlife and simply wanted to ensure that they were remembered. Our guide read us a gravestone inscription from a roadside grave marker and it was so simple and so beautiful[INVALID]it just made things click into place and gave history a whole different spin for me." I'm not a fan of traveling in large groups of people, especially those who are not used to traveling and who are mostly older than I am. However, it was still fun and interesting, and the people were nice. "The cooking class was terrific! It was practical and easy, and the food was delicious!" Julian is a class act. He comes across a little stuffy at first, but over the course of 10 days he really loosens up and is a lot of fun. A wealth of information with great stories. He made the trip for us. On balance the food was pretty good, particularly last night in Florence and Rome. The ancillary tour guides were outstanding and the color they provided made the trip. Very passionate about their cities. We really enjoyed the wine tasting and the cooking school. Just a lot of fun. "Seeing Rome and the Forum." Very well organized and informative. Plenty of time to experience the surrounding areas on your free time. Nice to travel with others who have also researched the other places of interest. Received good suggestions on what to bring when traveling to a foreign country, such as clothing, money belts, chargers. "My personal favorite moment was the gondola men singing happy birthday to me! On the Grand canal at night. That was over the top!" Excellent guides. Exceptional food. Very impressed with whole experience. Hotels helpful and restful. Not a bad thing to say about it. "The food, restaurants, cafes, wine tour and cooking class. Great fun." Better than we ever dreamed! On our plane ride home, I was happily re-living each day...and wondering where our next Rick Steves walking tour should be! From Julian, to the city guides...all were more, better than I had expected! The hotels were a bonus in that they were so well located in each of our cities. The bus rides were entertaining...Julian's stories..music...roadside stops...and of course, the views, were outstanding..a living postcard! "I have been thinking about my many "wow" moments, since we returned 2 weeks ago. But, I do believe my most favorite "wow" was the afternoon in Venice on the Grand Canal..and the stories by Julian...the 2 islands that we stopped at...visiting the first Catholic Church built in 400 AD...in Venice...Torcello... I was totally overwhelmed by the artistic and structural beauty of this first church..."
"Seeing the statue of David and other sites in Florence that I had studied so many years ago"
"Probably Venice - the gondola ride - there is no place like Venice, so it was really a wonderful, special experience"
The hotels, transportation throughout, local guides (3 of 4) were outstanding! Our guide, Jamie, was very good. His personality was fun and engaging, especially in small groups and when with him one on one. Two of the 4 dinner meals were poor, in Florence and Rome. The cooking class and the trip to the vineyard exceptional and are noteworthy. The location of the hotels were outstanding. And, thanks for the perfect weather!! "The awareness that the state of Venice really did not participate in the Feudal System, was not really beholden to the Vatican and was driven by trade / capitalism. So different than anywhere else in Europe. Also, the physical isolation of Venice that helped preserve the buildings and allowed it to thrive for so long. The cooking class and the trip to the vineyard exceptionally noteworthy, as mentioned. The tour guide for Rome was exceptional in making us aware of how Rome was "forgotten"." I was impressed by the local tour scholars in all 3 cities and the fast access to the best sights in each city. The people in our group were gregarious and adventurous. The bus rides were comfortable and very pleasant. 2 of the three hotels were very good and the breakfast food was great at all of them. We were able to see the most "important sights"and yet get a taste for the people and the culture of each city we visited. Jamie was fun guide and very personable. "The most fun I had was the Florence cooking class and being able to enjoy the food we prepared but a close second was the wonderful winery visit and how welcoming the people there were to our group." This trip was planned for my son's 30th birthday. We really did not do much planning and decided to let the tour drive our trip. Each day was a different experience yet provided enough structure that we quickly became comfortable in our surroundings and enjoyed exploring in our free time. "We loved Venice. Rome and Florence introduced us to the wonderful history and art of Italy, but Venice was an experience for the soul." I was a little apprehensive before the trip because I had never taken an organized tour before. Happily, I was very pleased with this tour which exceeded my expectations. I learned a great deal from my guides. I found my trip companions to be interesting and easy to get to know. I felt the tour was both engaging and refreshing. "There were several while moments. However, the tour of San Clemente church in Rome was the top well moment for me." The tour exceeded our expectations. Each city had its special charm. Accommodations were great, especially in Venice and Florence. Food was outstanding. Jamie did a great job of choosing restaurants for our meals as a group. Jamie was a wonderful guide! He was knowledgeable, fun-loving, and just a great all-around person to travel with. Our group was pretty diverse and came from all over the country and Canada. We very quickly became friends; lots of fun. "So hard to choose but one was arriving in Venice. It was more than I expected; so unique, charming. I felt like a European resident while there. Loved all the little alleys and squares. The overall feel of this city was a "wow" for me. A second "wow" would be seeing the Coliseum in person. It is huge! And our guide really brought it to life for us; not just ruins. I have always wanted to see it and it did not disappoint." "It was definitely the David statue it was spetacular." Seeing all the highlights of the tour was amazing! Our hotels & the included breakfasts were very nice & the staff at the hotels were very professional & helpful. Everyone of the local guides were exceptional! The provided bus from Venice to Florence & also Florence to Rome were quite comfortable with adequate stops along our route. Our Guide was personable, easy to talk to & enjoyable to be with. Dave helped one of the tour members change her plans when her father unexpectedly passed away! "Seeing the David & the unfinished sculptures by Michaelangelo and the Bridge of Sighs were my "Wow" moments." Truly amazing! It made me realize what I don't know about the struggles and triumphs that have impacted civilization over the last three thousand years. Yes, I realize 3000 years involves pre-Roman culture, but the Romans didn't "invent" everything themselves. "Standing on the new "floor" (reconstructed deck) of the coliseum and trying to comprehend the engineering/construction challenges of building this facility. There were no cranes as we know them, 3-D modeling to determine interferences/fit, no laser alignment tools, hydraulic jacks, and obviously no structural steel yet look at what they produced and it's still standing even though parts of it were "robbed" to construct other facilities!" The tour was Incredible. Very organized and allowed the whole experience to be very stress free. "Seeing the statue of David!!" The tour content was great, included the popular sites as well as additional sites that are not as well publicized. Dave was outstanding, extremely helpful and very knowledgeable. "The gondola ride in Venice. It was an "extra" that I recommend be added as part of the tour." Love that the tour provided a combination of sights and experiences (cooking class, gondola ride, wine pairing lesson, multi-course dinners). Love the tour guides that gave context to what we were seeing and helped us maneuver through the crowds and lines. Love the ease of the transportation. "1. The San Clemente Church and Forum tour with Francesca was moving and sparked imagination. 2. The gondola ride at night with the singer and accordionist felt like a magical Disneyesque experience. 3. Learning to make your own pasta and cook a complete Italian dinner, followed by a meal in the cellar. 4. Dave treating us to gelato and educating us on what constitutes a good gelato. 6. The wine pairing lesson at the beautiful country winery." The guides, the hotels, the food, the tours were all Outstanding! I have not a single complaint. It was all as described in the literature as presented by Rick Steve's before we left. There was a warning of hotels do not provide soap, shampoo and things that American Hotels supply, but I did not experience that at all. The only change I would notate is that Italian hotels do not supply was wash cloths and public restrooms do not always have toilet paper. Wonderful Trip! "The street view and the taste of the pizza and wine." It was wonderful. Not having to organize tickets for museums and sites made the vacation a vacation. It was much more carefree being on a tour that takes care of most all the planning for you. I found it fun and rewarding keeping the luggage to a carryon only. I did see people (not in our group) dragging luggage up over steps in Venice and was glad to be much more mobile. "David. The details in his hands and the way the knee was carved with all the musculature. His size 17 feet tall. Turning into the grand canal on our first boat ride into Venice even though I was very tired from traveling was a wow moment also." "Never having been to Italy, I thought Rome would rate last in our city visits. Francesca, our guide for the Roman Forum, created an eye opening, revelatory morning. "Old Rome" was brought to life. In addition, All of our guides added a depth of experience that surpassed simply seeing sites." The tour was everything I expected and more. The description in Rick Steve's brochure very accurately stated what to expect. There was no exaggeration of what was offered. In fact, the tour was even better than I expected. I appreciated the excellence of all the tour's guides. Both our guide who was with us throughout the tour and the local guides were phenomenal. They were knowledgeable, passionate about their subjects and very personable. "It is hard to name one favorite "wow". I loved that we had a chance to take the gondola ride with a singer and musicians in Venice. I enjoyed our Italian cooking class in Florence. Our visit to the winery was wonderful. The trip to Vatican City was very successful and informative - a truly awesome experience made possible by our local guide Marta." This tour exceeded our expectations. All the guides, activities, hotels, and meals were terrific. "Wow moment for me was the group dinner in Florence. Not only was the food & wine delicious & plentiful, the camaraderie of our group & leader made it feel as if we were dining with longtime friends. Another Wow moment in Rome was Saturday morning tour & service at San Clemente church. The local guide was excellent and the sights & sounds & smells of the different layers of the church made it seem like history come to life. Incredibly unexpected!" This was one of the best trips I've taken to Europe and I have been there at least seven times. "My favorite part of the tour was the day we had Francesca take us on the Colosseum tour. She was amazing! She brought those old ruins to life for me. By the end of her time with us,I was so moved, I was a bit tearful. Whatever she is being paid by Rick Steves, it's not enough." From the moment the LED lights came on in St. Marks at the end of our tour, the first day, I knew everything was planned perfectly. I don't think I'll travel Europe again without Rick Steves. "I had so many wow moments I can't pick a favorite. I have to go back to the planning of the trip, just when I thought things couldn't get better something better happened." See comments from my wife Suon from Burke. The tour was well organized and went as advertised and scheduled. The hotels were all comfortable and very well located. The guides were all excellent; knowledgeable, organized, easy to understand, engaging. Our tour companions were friendly & interesting and added to a very positive experience. The itinerary was effective to see most of the best known sites in each city. There was a lot of free time for additional exploration; sometimes it was hard to decide how to best use that time. "Each city had "wow" moments when we visited well known attractions: especially the canals and gondola ride in Venice; Michelangelo's David in Florence; and the Pietà, Sistine Chapel and Coliseum in Rome. An unexpected "wow" was a free evening in Rome that included a stroll up the Spanish Steps just before sunset, many gorgeous sunset views from Villa Borghese gardens, and wine at a rooftop cafe with a full view of the nightlife on the Spanish Steps and Piazza di Spagna. It was magical!" We saw all the major sites in each location, as well as having a few serendipitous experiences. The tour was a good mix of group time and our own free time, and I appreciated the small size of the group. I would have liked one more day in Florence, but in general, I thought the overall plan was perfect. We stayed a few extra days in Rome on our own, and we were happy we were able to do that. "I knew I would love Florence, but I was surprised at how much I enjoyed Rome. It is such a modern, vibrant city, and there are art and historical wonders seemingly around every corner. The foundational guidance of the tour guides helped me appreciate what I did and saw on our free time." "Michelangelo, Michelangelo, Michelangelo! My first favorite was Michelangelo's Pieta in the Duomo Museum in Florence. We got our tickets for this on our own ahead of the tour because we knew we wanted to see the art displayed there. Then we went on to see his David, his Prisoner's, and one of his Pietas. We got to see his paintings in the Sistine Chapel and The Last Judgement. (Amazing!) I appreciated the 30 minutes we were able to spend in the Chapel. I understand from other visitors t"
We had a marvelous experience. The tour was well planned from Martin's insights and humor, the fantastic meals we enjoyed and the accommodations provided. Italy in October is beautiful! "So many. Too numerous really but I will try. The Sistine Chapel was incredible. St. Mark's in Venice was humbling. St. Peter's in Rome left me breathless. The Coliseum and Forum left me with the sense that I was in the center of Western Civilization watching history unfold over more than 2000 years. The Duomo in Florence was imposing up close and from the vantage point of Michaelangelo's gardens. The tour of the Tuscany vineyard and the tasting was down the list but very nice as well." This was my second trip to Italy, but my first to these three cities. It was outstanding for me. The commentary and observations by our RS guide was rich and thoughtfully presented. The local guides in all three cities were excellent--not only knowledgeable but passionate about the sites and their country. I think there was a good balance between guided tour time and free time. .
"I loved the church of St. Clemente in Rome with its layers of history. Francesca, our guide , did a great job of inspiring us to see that we are part of this history and this treasure is something we can learn from and cherish. Our nations are intertwined because of our shared origins and history. Italy (as well as the US) are not isolated nations but we are inextricably linked because of history. The architecture, the art, the language we are related to it all & have grown in understanding." From beginning to end we appreciated clear, timely flow of information. Rick Steves Tour selected excellent sites to visit in Venice, Florence, and Rome. The RS Guide was excellent--knowledgable and personable. The supplementary guides in all three cities were also excellent. The guide in Rome, Francesca, was superb. Hotels chosen were right in the center of the areas of interest. The Rome hotel was near the Vatican. I would have preferred a hotel on the other side of the Tiber. "The tour of the Basilica Di S. Clemente was extraordinarily enlightening. We saw first-hand the history of Rome, layer upon layer, basilica upon church upon house upon early structure." Rick Steves tours are the best, and this tour of Venice, Florence, and Rome was great! We love that there is plenty of free time built into the schedule for exploring on our own, while the formal tour covers all the essential, "must-see" experiences. "Just about everything in Florence: seeing the Duomo for the first time (it's so big! ), Ghiberti's doors, Michelangelo's David, and the Medici Chapels were our favorites." Tour was well organised, well paced. Martin did an exceptional job on the tour as well as suggestions for things to see and do during free time. The group size was ideal and there quickly was a chemistry among the group. "Before the tour wondering the streets of Venice exploring on my own finding Santa Maria Gloriosa dei Frari During the tour The Winery tour overlooking Orvieto - What a view, priceless After the tour Ostia Antica a walk through history and no crowds"
This tour was absolutely amazing! A bucket list trip for me. My husband and I decided to spend 2 weeks in Italy. We wanted to incorporate a formal itinerary with time on our own. We decided to add time on either end of the trip. 10 days with a group was perfect. Julian our tour guide was a wealth of information! He answered questions, told stories and provided great backdrops to what we were seeing. What I did not expect was to have other guides for specific sites. How wonderful!! "There were so many "wow" moments, I can not limit this response to just one. Was it the Ufizzi, the Vatican, the Academia, the Roman Forum? Or was it the lunch in Umbria on a vineyard, with a tour member singing opera (in Italian) to us? Every city, and stop had it's own "wow" moment. That is the beautiful thing about this country, and our tour." The tour was a great balance of group activities and free time. Our guide gave us the knowledge we needed to navigate the cities independently and enjoy time on our own. The time in each city was perfect. "Going out and watching the cities waking up each morning before breakfast." We can't say enough great things about this tour and our guide. I came in questioning the "free time" that was scheduled in each city but quickly understood how important it was. "After being blown away by the Basilica Di San Clemente we walked a few hundred steps and rounded a corner to reveal the Colosseum.I will never forget that moment." This trip was absolutely wonderful. The location of the hotels was perfect, and truly important for making the most of the tour. The tour was the perfect balance of group led activities (mostly in the morning), and free time in the afternoon- when we could explore, sit with a glass of wine, rest, or visit more museums. The RS group experience appeared to be a factor in getting us access to sites in a timely manner, and to have us in the right place at the right time. "Getting lost in Venice, and wandering around but not being lost at all. Narrow alleys and small bridges, and gondolas.... it is a magical place." I wanted to show my "over 40" son the wonder of Italy while I could still keep up with the group and enjoy it myself. Although my son has never been one to be overwhelmed by art, our guide was most helpful in giving us the whole experience. While on our own, we managed to lose our way in every city but enjoyed the wandering. We hit the highlights and had many surprises as well. So happy to be with a multi-age and interest group. Hotels and restaurants were ideal. "church of St. Clement with centuries of history...like a layer cake. As usual, Venice takes your breath away." This was my first tour and overall I was very pleased with the tour´s combination of hotels, meals, sites visited, and size of group.There was a good balance between guided tours, generally in the mornings, and free time in the afternoon and evenings. I strongly advise reading as much information as possible,such as the Rick Steve´s or other guides his downloads, before the trip. Our guide did assume some baseline knowledge of the area which we often did not have. "There were several WOW moments: Standing in the middle of any number of the magnificent cathedrals and being in awe at the genius of the art and engineering done so long ago. Photos just do not do justice to these places. The wine tasting lunch in Umbria with Marco and his wife was superb. It was a fun informative afternoon with excellent wine and food. The Vatican is of course an absolute treasury of beauty." 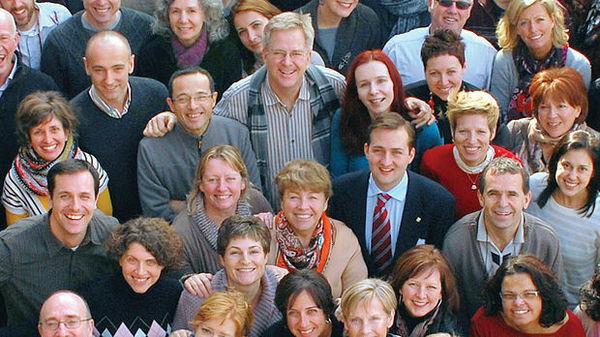 This was our first Rick Steves tour and we were a little worried about the size of the group (27). We didn't need to be; people were interesting and all worked together as a group. We moved around efficiently and saw a ton of things. I would not have wanted to try these cities on my own, given it was high season and the crowds were intimidating. I really appreciated that the tour guide had the tricks and tips for enjoying the popular sites as the best times. "I enjoyed the art in Florence way more than I expected to. I totally loved the "lasagna" layers of history and archaeology in Rome. My husband and I really enjoyed the city Orientation Walks, getting our bearings, learning how to navigate. These orientation walks gave us a great deal of comfort to head off and explore on our own." The tour was great, our guide was very knowledgeable. It exceeded my expectations. "There were many "wow" moments but one that was just perfection was the Family owned farm on our way to Rome. We were there to have lunch. In our group we had an opera singer and she picked this time to sing an Italian song, so there we were having a delicious lunch with a tasting of Italian wines at this beautiful Italian vineyard, just perfect." I loved our guide, Julian. He was personable and was a wealth of knowledge. Most of the guides were easy to understand and seemed to loved what they do. I loved the hotel we stayed at in Florence. All of the hotels were so close to the action, I was pleased. Most of the people on the tour with me were wonderful and had a sense of adventure and willingness to let me, a solo traveler, tag along with them on our time alone. "Laying eyes on the Pantheon for the first time. I've always been fascinated with Roman history and have studied the Pantheon but never seen it in person. It was as amazing as I thought it would be." This was my first time on a tour and I am definitely signing up for another Rick Steve tour. I enjoyed the ease of moving to various locations and not struggling to find the hotel and various sites. I enjoyed the evening walk when settling into a new place and getting oriented with the map. "It's hard for me to say I had one favorite "wow" moment as each day became my new favorite "wow" moment." This was my first tour and I was so impressed with the quality of the tour guides. I could not have imagined learning so much in such a short time to maximize the experience. The provided dinners were amazing. "The boat ride out into the lagoon of Venice and seeing the smaller islands. A nice escape from the city!" This tour lived up to its activity rating on the web site and brochure. It was truly a challenge ... but with great rewards! The architectural highlights, art collections and natural locations of three incredible cities were included with lots of background information to absorb and to put into the context of Italy's history. The wide range of sites and experiences far outpaces those of similar tours. In my opinion, there's no better option if you want to really 'feel' the cities we visited. "The tour of St. Mark's Basilica and it's museum was particularly impressive. I was hoping that it would be included with the tour, but wasn't sure based on the description in the itinerary. It was incredible that we were there when the flood lights illuminated the gold mosaic walls and domes of the church. Also being able to see, and be close to, the famous quartet of horses that have experienced so much history was a thrill. I only wish that photography was permitted." Loved Jamie as our tour guide. He was the perfect mix of fun and discipline There was a good amount of time to ourselves I enjoyed all of our tour guides at various locations This was our first Rick Steve's tour. It was a bit more hectic than i thought it would be but we loved it. "Lunch at the winery in Umbria"
This was my first international travel and I was amazed and thrilled with the experience. The accommodations were in interesting areas and the group and guide we travels with were fantastic. "It was "wow" from beginning to end for me..."
My husband and I were celebrating our 30th anniversary and a trip to Italy had been on our bucket-list. What a wonderful country for such a celebration! We were able to see the sights we'd dreamed of...and still have a desire return someday. "I thoroughly enjoyed the Italian cooking class in Florence. I didn't know that I could make homemade pasta! What a fun learning and bonding experience." What a phenomenal trip! Our tour guide was well organized, kept us on track and was extremely knowledgeable: we really felt like a local! "There are so many....but for me, I think it was the cooking class. Amazing!" We had a wonderful time and enjoyed every aspect of the tour. Our guides were exceptional, warm, and personable. "When we stepped into the wine cellars at the wine tour knowing that these were carved more than 2000 years ago was an especially poignant moment. The other moments were, of course being near the actual David sculpture and gazing at the ceiling of the Sistine Chapel." As always, Rick steve's Tours exceed my expectations. The hotels were wonderfully located and the tour excursions hit all of the highlights. I always end the tour with a smile and start the countdown to the next one. Reid was an excellent tour guide. His knowledge of the history of the cities enriched the experience. "I loved it all. Touring San Clemente was one of many wow moments. I really felt the history of the region when we traveled through time in the three levels of the church." John and I loved Italy. We had such a great time and and meet such nice people.Loved Venice, not enough time in Florence, and couldn't get enough of Rome. Glad we got to Venice early because we met up with a great couple that got us on the right track early. Florence-there was just not enough time. Got there late and left early. Rome was just enough, so easy to navigate because of where we stayed and the Metro.Also stayed an extra day. "Our wow moment was seeing and experiencing Venice for the first time. A small bookstore in Venice was our photographic find. The Gondola ride and our local tour guide were so much fun The Vatican,the Sistine chapel and the Basilica in Rome David in Florence and climbing to the top of the Bell Tower." I loved my tour! I responded very well to the schedule and enjoyed every aspect of the tour experience. "I was wowed by the food and wine and loved our cooking class! I am making pasta and bruschetta at home every night now!" I really enjoyed the overall experience. I liked doing this as a group as we got to know several people in our group fairly well. I also would not be comfortable traveling in a foreign country without a guide, so the structure of this type of a tour was great. I thought the planned activities were quite fun and interesting and I liked the balance between planned activities vs free time to do our own thing. "I don't know if I had one particular "wow" moment, but there were several highlights for me. The first was seeing the Grand Canal in Venice the first time. Even though I've seen pictures in books and on TV, there is nothing like experiencing it in person. Also just walking though the city with the narrow streets was exciting. Same thing in Florence, just experiencing the narrow streets. Perhaps my best wow moment was seeing the Coliseum up close. Quite amazing." Another fantastic Rick Steves' tour. I saw more and learned more on this tour than in two previous visits for Venice, Florence and Rome. "There were many "wow" moments, but the most fulfilling was being in the cities' neighborhoods." Amanda made the tour so much fun and informative. Our knowledge of the three cities and their treasures was greatly expanded. We particularly enjoy stopping for lunch at the Agritourismo in Umbria. "Amanda had arranged for a tour of the Vatican Museums and Sistine Chapel later in the evening. We had ridden the metro over and were all tired. Amanda picked up on our tiredness and chose to get taxis for us instead of the metro. That was a decision made by a seasoned guide and most appreciated." The tour was great! I appreciated Amanda and her expertise, along with all of the local guides. This made the trip so informative and provided a learning base for the many, many sights, art and cultural experiences. "It is hard to pick just one, but the David was a highlight for me. I also enjoyed the cooking lesson and lunch....it was a nice break from the museums. San Clemente church was such a surprise and very enjoyable." Our tour was phenomenal -this was due entirely to the expertise of our guide, Amanda, who was kind, knowledgeable, & thoughtful! Along the way she generously shared much detail & fielded answers to our many questions. Amanda's handling of the business/organizational aspects was excellent. The established rules & meeting times were clear. She repeated these so that we knew exactly what was expected. Amanda built a team spirit between the participants which added to the joy & enjoyment! Bravo! "The dinner we shared in Florence (?) was a wowzer...we were made to feel welcomed and appreciated. Before our dinner, Amanda shared many of the cultural aspects. It was obvious that Amanda was beloved by our host and we were treated as treasured friends. Each of the courses were scrumptious and the restaurant owner went out of his way to stuff us with the most delectable pasta dish, meat, and desserts. (9 choices!)" The whole experience - from booking our tour to our last moments together as a group - was absolutely amazing! I'd highly recommend Rick Steves to anyone I know wanting to tour Europe or any of the places you travel. Amanda treated us so well, teaching us about the areas and sights at every opportunity. The local tour guides were also fabulous, equipping us with the knowledge to identify the various saints, artists, building materials, etc., for when we had free time to tour on our own. "As a committed Catholic, I was very emotional walking where SS. Mark, Peter and Paul and other early Christians walked and attending Masses in and/or visiting the churches dedicated to them. Also, seeing the Cattedrale di Santa Maria del Fiore in Florence for the first time, with its colors blew me away, since I'd never seen a cathedral like that before." I did this trip for my wife, but I had a great time and learned a lot anyway. "The basement of the church showing what lay underneath was fascinating to me." My wife and I had a wonderful time on our tour. Our tour guide, Amanda, did a terrific job of managing our group. She took us to many memorable places and told us about the places, the history, and the cultural highlights. She was very knowledgeable and made us feel welcome. She helped our group get to know each other and feel comfortable together. "My favorite part of the tour was our tour in Rome with our local guide, Francesca. All of our local guides were excellent but Francesca was my favorite. She took us to the Church of San Clemente, the Colosseum, and the Roman Forum. Her descriptions of the sites, their importance, and significance were so informative and entertaining." We were able to see everything I had dreamed of seeing. Each city had it's own charm and the wine tasting experience was a great bonus. "It is hard to narrow it down to one thing, but the coliseum was much grander than I had ever imagined." Absolutely loved Italy and kudos to our guide Nina! She was so filled with knowledge about the country, the history, the culture, the language, the art and passed it on to us in a wonderful way. The museums and churches were stunning. The amount of history and art was boundless. I could spend years there exploring! I loved how the tour allowed us free time to explore based on our personal interests. You could go as hard and fast or as easy and slow as worked for you. "I truly enjoyed the wine tasting lunch at Poggia Volare with Marco and Gavia. The background on his life and his agri-tourism business was fascinating. The grounds were lovely - a beautiful oasis after the hustle of the cities. The food was divine - and I loved how they paired it with the wine and explained the reasons why." The people on the tour were very friendly and everyone got along with each other. Made many new friends. Since I walk with a cane and was slower than the rest of the people, Nina made certain that we were always in contact with the group. Only drawback for me was the amount of walking and stairs involved with the sites. But I knew thee would be this before we left. Perhaps you should gear a tour toward people like me who has some difficulty keeping up. "Cooking class where we made and ate our own food and the wine tasting stop on our way to Florence." Our trip to Venice, Florence, and Rome was a trip of a lifetime. Although I thought I knew what each city would look like and offer, I was astounded by the actual experience. Nina Dierckx was a wonderful guide: smart, witty, and well-informed. Her love of and understanding of Italy allowed us to feel part of the history and culture of each city; by the end of our ten days, we all felt "Italian." "Each city had a "wow" moment. In Venice it was St. Mark's Basilica and Square, although our trip to Burano and Torcello ran a very close second. In Florence it was our visit to the Uffizi Gallery. How incredible to see the paintings of Botticelli, Michelangelo, and Raphael that I had only seen in art books. Second place would go to our tour of the backstreets with our local guide, Olivera. In Rome it was the tour of San Clemente and the Colosseum with Maria Laura." This was our first tour ever and I was a bit skeptical because we had always traveled on our own but I am 100% converted. Your Rick Steves tour exceed all of my expectations. The overall experience was just wonderful. "My favorite WOW moment was disembarking from the bus ride onto the agricuturisma working vineyard and olive tree farm. I felt like I had stepped back in time to my parents countryside town outside of Matera. I could have stayed on Marco's farm for a week, it was that relaxing. Our hosts could not have been more gracious; the food and wine was divine. I was able to practice my Italian with Marco (as well as with our bus driver Georgio). The whole afternoon was heavenly." Wow! The whole tour was a WOW moment! I wasn't really excited about going to the wine tasting event, having been to a few in the states (Boring) but it was amazing. The explanation and talk by Marco was enthralling!!! Gavia's presentation of tasty delicacies was a most amazing treat. I have to say that ALL of our guides were very careful to steer clear of political landmines. After all, we were on vacation. "OH my, that is tough!! I would say it was the Colosseum and Forum Walk. Ilaria was a wonderful guide." My overall experience was nothing short of wonderful. All three cities have their own histories and personalities so each was exciting in its own way. I enjoyed our time as a group and appreciated our time to do as we pleased. The accommodations were comfortable as were the buses between cities. "Watching the sunset at the top of the Duomo Dome." Italy was my second retirement reward to myself following my Paris Tour the week before. I was still overwhelmed with the Art, Incredible food, wine and constant movement from one grand experience to the next when I arrived in Venice a day early, by myself thinking that nothing could compare to that. I was wrong. The next day I was introduced to Italy or a continuation of my bucket list dream with more gelato and better coffee thrown in. Worth the walking (aka training)to see and experience. "The winding bus ride to a vineyard and olive grove for an authentic Tuscan luncheon experience of wine tasting, food pairing, and education from the owners. We had fresh figs unlike any that I had tasted. We were sitting at the large outdoor table overlooking a swimming pool and rolling green tree lined hills when I said to our group that "this is the Italy that I imaged"." This was my first tour experience so I have nothing to compare it to, but it was wonderful. It was the perfect mix of seeing the major sites with a guide & still plenty of free time. Our tour guide, Nina, was top notch! We have already recommended this tour to our friends & family. "It's hard to pick one thing, but I guess it would be seeing how people live in Venice, where there are no cars & all the colorful houses. Like a scene out of a movie. Also, visiting the winery & seeing the beautiful farm was a "wow" moment." I did this Rick Steves Tour 10 years ago with my mom and this time did it with my husband. I didn't feel like I was on the same tour at all even though I was back in Venice, Florence, and Rome! I got to see highlights a second time (David, Uffizi, Coloseum, Sistine Chapel) while other sights (private boat to Burano & Torcello, San Clemente, cooking class, Marco's winery) were new this tour. The cities themselves had changed some too of course. Fun group of travelers! "Rome in 2.5 days 10 years ago was overwhelming! This time I fell in love with Rome!" It was excellent, if a little exhausting. I was not prepared for the crowds at most of the sights (especially Florence and Rome) and how much effort it takes just to be in them. "Most of our time in Venice. A leisurely time in the Doge's Palace. Marvelous seafood in quiet squares." Perfect tour! This was our second trip with Rick Steve's and it exceeded expectations. Our guide Margaret was amazing and knowledgeable patient, organized and fun. Our travel group was very compatible. Looking forward to our next one. "We really enjoyed the cooking class in Florence and, of course, seeing the David." We wanted to see these three cities and felt like we did. Loved our evening tour at Vatican museum. I was very happy with the overall tour experience especially Margaret's management, leadership , enthusiasm and good sense. The operation of the tour from initial sale to this email bespeak an organization with wise and capable leadership. "Being led through Venice on the first night and realizing we were in good hands"
My wife and I planned this trip for our 25th wedding anniversary. The trip could not have been better. It was the perfect balance of guided group events and free time to explore on our own. The guides provided expert information on some of the greatest historical sites. "It's hard to pick one moment from the trip but I have to say the trip to the winery in Umbria was one of the quintessential Italian experiences. I want to go back!" We had an absolutely wonderful time on our tour! It was the perfect balance of seeing the amazing art and architecture of Italy while being exposed to its rich history and culture. The tour keeps you on the move but we always felt we had time to go explore on our own as well. We thoroughly enjoyed our guide Margaret and the other members of the tour. "We especially enjoyed the wine tasting lunch with Marco at his family-run winery!" The tour was excellent. It was the first tour I was ever on and I could not be happier with all that I saw, learn, and did. Margaret was an excellent tour guide. "It was the all the sights in Rome. I especially like see the Vatican Museums and St. Peters." We had a wonderful time in Italy. Margaret was very nice and patient with our group. I thought there was a good balance of structured tour with the group and free time on our own. Being able to zip to the front of line was a great benefit. Margaret would give us our scheduled meet time in advance so that we could plan our free time. We also got along with everyone on the tour and no one was late for our departures. "Boy that's a tough one. Each city had their bright spots. If I had to pick one it may have been the David sculpture in Florence." The entire tour was very enjoyable. I met wonderful people and learned so many things. "There were so very many it is hard to single out just one. I really like the wine tasting trip. Cecilia was an excellent source of knowledge and has great wines !" The Best of Venice, Florence, and Rome 10 days tour was an amazing trip for my first time to Europe. The trip itinerary was well organized with recommended sites and activities to do during our free afternoons. "Since we arrived in Italy at night, my favorite "wow" moment was simply seeing Venice in the morning from our hotel room. It's so hard to choose just one favorite moment as every day was a "wow" day. Turning the corner in the Accademia Gallery and seeing Michalengelo's David at the end of the hallway was probably at the top of my list. I could have spent days in the Galileo museum!" Having been to Italy twice before, I wasn't sure that I could see or learn anything new. Boy, was I surprised! Our guide, Amanda, was a wealth of knowledge about all three cities and the history surrounding them. I was also impressed with how she managed to get 28 people around the cities so effortlessly and in such a manner as to see so many sights while doing it. We had a wonderful group and hope to see some of them this January at the RS reunion weekend. "My wow moment was probably on the last night when I realized I was going to have to leave my "friends" the next day. I didn't expect to make such good friends in such a short time! Wow #2 came when my husband said he wanted to do the RS Spain trip because our guide Amanda also leads those!" Venice, Florence, Rome... what could be better. I so appreciate all of the pre work that takes place in advance. Tickets in advance and local tour guides made the experience so much less stressful and more meaningful. Every detail taken care of perfectly. "What can be more of a Wow than turning the corner and seeing David. What a handsome man he is??" I was hesitant about going with a large group which I thought 28 people would be a large group but I was surprised it was really great and we met a lot of really nice people. The tours that we took were fantastic got to see a lot of the main attractions in Venice Florence and Rome. Using local guys was fantastic since they were able to give us their experience in the certain cities are attractions that we visited. "I think just experiencing the three cities and the difference is in them. Also how old it was I mean I always knew that a lot of the buildings and stuff in Rome and Florence Venice were old but it's just amazing how well kept some of them are for being that old. I really love the wine stop on the way from Florence to Rome Cecilia had a beautiful place and it was good to learn a lot about Wine and Food. The cooking class was also a highlight for me." We had a wonderful time. Amanda our guide was incredible. We met a lot of new friends. The mix of organized and free time was just right for us. "Orvieto wine tour and tasting AND st clements vertical history book in Rome"
Saw all that I wanted to and a lot more. On the go a majority of the time and covered a lot of ground. Learned a lot about the culture, history and important facts of all areas we visited. "THE Colosseum, THE David, THE Sistine Chapel, Vatican City. Other major fun things were the country winery between Florence and Rome and the old church with it's two lower levels on the way to the Colosseum." I loved that you were able to spend time with the group, but you also had time to yourselves to do what you wanted. I loved the guide Amanda and the guides from each city. I would not have gotten the same experience if the guides had not been there to tell you about the sites. "I loved ancient Rome. It was so awesome to see those big buildings and how they still stand today through all the weather changes, wars, etc. I also loved "The David" that was incredible." My wife and I had a great time. We learned a good deal. Walked a lot. Ate well. Acquired experiences that we will share for the rest of our life. "The "wow" moment was thinking about the future while walking in the Roman Forum. If such a powerful society can end up in ruins, so can our current society in the US. A very sobering thought, but powerful. If you want a positive "wow", it was the Pieta." The tour was absolutely wonderful. This was our first trip to Europe. We loved that all our sightseeing was preplanned. Amanda did a terrific job sharing her knowledge of Italy with all. In each city, we also had local guides escorting us through important areas. The experience with each was amazing. It helped us understand so much about what we were seeing and experiencing. Everyone in our group was so friendly, and we had so much fun at all the group activities. "There were so many WOWS--can't choose one. Loved the cooking class in Florence: so much fun! And the food we made was great! Seeing the David in Person. Rounding the corner in Rome and seeing the Pantheon for the first time. The Vatican Museums and Sistine Chapels. Memories that I will cherish forever." Being part of a group, not having to wait in lines. Having wonderful local guides that shared so much information with us. Everyone in the group was pleasant and very open to meeting everyone. No one was late. Everyone could keep us with the place. "There are too many WOW moments to mention. Arriving in Venice, seeing St. Marks Square, and staying next to the Opera House Going to the Island of Murano on our own. In Florence walking the Ponte Vecchio, seeing Brunelleschi's Dome, and standing near David. Going to the Leather factory and buying items. In Rome going to the Vatican." I thought this tour had a great balance of spending time as a group and exploring on your own. Each city had something very different to offer and it was an amazing experience. "Taking in all the art! There was so much to see and the scale of the statues is insane!" Our tour was so well organized and tour guide Rainer arranged for special experiences on the tour such as a gondola and seeing crowd we'd museums in the evening, being able to attend Mass at the Vatican, climbing the Duomo dome, which made everything more meaningful. "Seeing the Michelangelo crucifix in aflorence." Our experience was incredible. Our tour family bonded and I loved that we looked after each other. I really appreciated that everything was handled and I could really relax and enjoy the experience. "There were so many WOW moments. The first one was the stop in Umbria and meeting Marco. I loved the farm, the passion that Marco and his wife have their land, and just loved being. My next WOW was Francesca and our tour of Ancient. She had me in tears." Had a great time. Well sized group, excellent tour guide & local guides, good food, free time interspersed made this a memorable event. The special visits (Agritourismo farm & learn to cook), were particularly good social events. Have conveyed this to others already. Would do again. "Although it was clearly fantastic to view in person, the many historical sights in our tour, my most memorable event was the cooking school in Florence. Making this meal, with all our new travel friends, under the guidance of our congenial chef Fabrizio was a kick!" We loved every minute of our tour. Our guide, Rainer was great. Our hotels were great. It was so wonderful to show up and have all the little details taken care of. The only thing I would suggest is when you send out the itinerary, that you include the name of the island that we would visit in Venice. We arrived a couple of days early and wanted to visit an island but didn't want to double up so we passed. That would be good information to have available. Thank you! "There were so many! I would have to say the Colosseum in Rome. Wow!" The trip to Italy was excellent. Our guide Ranier, was knowledgeable, experienced, helpful and professional. Our tour was nicely balanced with group activities and leisure time. The write up of how strenuous this trip was is quite accurate. We walked a lot and stood listening to our guides giving us good historical background about what we were seeing. Our group was exceptional. People were friendly and sensitive to others. We formed some great friendships. "Really hard to choose one wow moment as the whole trip was so wonderful. I was amazed at the beautiful architecture in each of the cities we visited. The original art that is just everywhere in Florence was astounding. I loved Venice and found it just charming. Rome has so much history which surrounds one on all sides as well as underneath your feet and seeing the splendor of the Vatican was something that is hard to take in. Just too difficult to choose on WOW moment. Loved it all." Never having been abroad, I didn't know what to expect. I compared tour groups and the Rick Steves' tours just felt like the best fit for my sister and myself! All details were covered from the airport to the hotel, down to the last detail in directions. And coming in a day early was a great suggestion! Our group was very diverse, but right from the beginning we all hit it off! Rainer was an excellent guide and was so knowledgeable about Italy & places to recommend to eat and visit while there! "But I'd have to say that my personal WOW moment was when Rainer arranged for the group to take an optional gondola ride. There we were, cruising the smaller canals, when our gondolas turned the corner into a narrow canal with the acoustics just perfect as our lead gondolier broke into "O Solo Mio"! An epic moment for this Italian girl that brought me to tears!" Everything was outstanding. Hotel choices, all the guides, tours and other group activities. We will be back for another RS tour. "Our guide organizing a night time gondola ride with music. Cooking school. Side trip for wine tasting. Gladiator entrance to the colosseum. Private boat tour in Venice." Fantastic! I appreciated starting with the smaller city, Venice and working up to Florence and then Rome! I'm also grateful the RS tours advertises "No Grumps" and how you have to be active and able to walk and climb stairs with luggage. Our group was so fun! We all really bonded and enjoyed each other. Everyone could keep up and was gung-ho to try new things. The cooking class in Florence was a blast! I'm not a good cook and don't really like to cook, but that was a highlight. "Stopping at the winery on our way to Rome. Cecilia was so gracious to welcome us to her ancient home and wine cellar. She presented a lovely wine tasting lunch in her dining room that was as informative of her culture as it was tasty. The views from her yard were spectacular. This is where I really received an understanding of Tuscan culture and family life." "Seeing Venice for the first time. The Colosseum was great as well." It was fabulous. I loved having three days in each city to explore, learn some of their history, and to see some of the historical sites. "Venice: St. Marks square Florence: the David Rome: the Sistine Chapel"
We have learned the best way to see the sights of a major city is with the tour! This was our third RS tour! We were actually in Europe for 6 weeks and scheduled this time into our adventure. It was great to walk past the long lines of "no ticket" people, in the sun, and have Margaret and her guest guides give us the information! We walked into the Colosseum, Gladiator entrance and WOW! We handled Ireland, Milan, Varenna, Naples, Hamburg and Stockholm ourselves, with your help of course! "Seeing the great masters work in the art galleries, Churches and museums! All of it!" This was the second RS tour for my husband and myself. We had high expectations for this Italy tour since we had such a great time last year on our Spain tour. The Italy tour met our high expectations. Our tour guide, Margaret, was very knowledgeable and passionate about the country. The group was very friendly and made the trip very interesting and enjoyable. The pace and activity level of the tour was perfect. "We enjoyed so many of the sites and activities. As for a favorite "wow" moment, we agree that it was seeing Michelangelo's David. In addition, the trip through the Colosseum was remarkable. The gondola ride was wonderful. The Sistine Chapel and St. Peter's Basilica were also great. We also really enjoyed the San Clemente Chapel." This was my first time to Italy. I thought the tour provided a wonderful overview of the 3 cities we visited. Great balance between planned and unplanned activity. Loved the local guides and thought this enhanced the experience in museums, especially. "My two favorite experiences were the cooking class and the winery stop. I was wowed by them both. I think the biggest take away, though, was how much I enjoyed the people on the tour. This was a great group and it was easy to travel with them all. Seeing David in person, was also a wow moment, as well as the Sistine Chapel." Margaret was an awesome tour guide! She made everything so enjoyable. The hotels we stayed in were very unique and interesting. Had a difficult time finding the Venice hotel we stayed in and the directions to that location could have been better. (even the local police couldn't help us find it!). Be prepared for very, very small showers! Definitely not what we are used to in the US. :) Margaret took us on a winery tour on our way to Rome that was breathtakingly beautiful! "So hard to pick just one!" We were energized throughout our entire trip and did not want it to end. The experience exceeded our expectations. "There could not be only one "wow" moment between Venice, Florence, and Rome. Each area had its own history, beauty, restaurants, and local flare. But if I had to choose my favorite, it was St Clements in Rome where our guide led us through ancient structures buried underneath the church and explained that there is an ancient city under a large part of the city of Rome." Enjoyed everything we did and the hotels. "I've waiting all my life to see the art in Florence, but seeing David was my "wow" moment." The Best of Italy Tour was exactly as described in the description. We were treated to sights, sounds, and activities that are truly Italian. Yes, we were visitors, but it felt like we were given an authentic "snapshot" of the location by a guide who truly loves the cities we visited, and wanted us to experience them in the best possible way. "It's hard to pick just one thing- my top 3 would include the cooking class (tons of fun),the Sistine Chapel (incredibly moving), and the gondola ride (so romantic)"
This was our second Rick Steves tour, and our experience here was just as wonderful as the first one. I love the mixture of popular (many tourists, but you really need to see them) and not so touristy sites we get to visit. The emphasis on "live like a local" comes through clearly. The tour is not just about seeing things, but experiencing things, as a tourist and as a local would experience them. I also like the mixture of formal tour time and free time, and not traveling every day. "Probably the best example of a "wow" moment was our visit to the church of San Clemente in Rome. It is a 12th century church built on top of a 4th century Roman basilica, which was built on top of a 1st century neighborhood that includes a small street, a Roman temple, and other buildings and rooms. Walking down through those layers to a street and floors that were walked on by Romans 2000 years ago was mind blowing." #1 Our main tour guide for this trip Julian was a great host and guide. His introductions to Venice, Florence and Rome set the stage for a great time in these three cities. #2 The local guides in each cities gave us a love for these places that we will carry with us always. A tremendous depth of knowledge of their areas and a personal love for being there. #3 The wine tasting we did was one of the best food and wine parings I have ever been to. A fascinating setting and host. "When Julian had a family emergency and had to leave with 2 days left in the tour, the transition to a new host who completed our journey, was extremely impressive. The depth of this organization and it's compassion for their staff, showed me why I am so happy to use their products and to have been a part of this tour. The people we met were also all game to connect and help each other. We're sharing photos now." We have traveled quite a bit, always arranging our own itinerary and accommodations in the past. This was our first group tour experience. We chose to join a tour because of the complicated reservations necessary for many of the sights and sites we wanted to experience in the 3 cities in Italy encompassed by the tour. We appreciated the excellent locations of the accommodations in each city. We loved the "extras", including evening gondola ride. Julian, our guide, enriched our travels. "Visiting the vineyards, olive groves and working farm/villa outside of Orvieto. Such a wonderful wine/food pairing and tasting experience. Loved exploring the Etruscan-originated cellars below the beautiful stone main house." Memorable:I am today still reflecting back even today on experiencing Italy,the tour group moments of those historical places of interests, the restaurants/food, and how special it became of the tour group people becoming tour group "friends." "The Doge's Palace. Four hundred years of Architecture, Art, Government, the Nobles, judges, jurys, and executioners - "a must experience..." WOW!" "My greatest wow was taking a gondola ride in Venice while there was an orange, full moon." The tour was truly outstanding. It was much more than what I had expected. There were 27 of us on the tour, plus an exceptional tour guide. I would highly recommend this Rick Steves tour to anyone who wants to see, feel and taste Italy. I loved it so much that I want to go back on the same tour in a couple of years to relive the experience. Next year we want to take a Rick Steves tour to Ireland or Greece. "There were many, many "wow" moments on the Rick Steves Italy tour. The one that captured my soul was seeing Michelangelo's David in Florence." Overall, the tour was well organized and the tour guides were well informed. Having never been on a guided tour I was somewhat apprehensive, however the 10 days were better than I could have imagined. Well planed, interesting , I would recommend the experience to any one traveling to Europe. Our tour guide was extremely knowledgeable, on top of all the details and a true pleasure to be with. Roxanne definitely made the experience special. "WOW moment, I was having such a good time each day was a WOW moment. Every experience was so well planned I was going from one to the other, museums, walks, churches, food, with great expectations and not disappointed." My first time traveling abroad (don't count Vancouver and Victoria B.C. or Mexico). Could not have asked for a better experience. The tour was well planned out and entertaining. I learned so much about how to travel as well as a ton about Italy, art, wine, food...a long list. "Seeing Michelangelo's David was without question the highlight of my trip. I never knew the history behind this specific work, or the history behind how important it was for an artist to take on this subject." Had been referred to Rick Steves Tours by a friend. The tour far exceeded my expectations, even after I had heard such wonderful reports by my friend. The accommodations were quite nice (Florence outstanding), breakfasts great. fantastic tour guides, and best of all: the architecture, history, art and culture of Italy! "I guess my biggest wow moment was seeing the David. We also enjoyed the cooking class, the chef was so funny and engaging he made the lessons so much fun and to be able to eat our food after was great. However, it would of been nice if we were served our food only. It seemed like they just put the food on the table for everybody regardless of who made it. I know we got our own tiramisu because we put our initials in the top." This is one of our most active tours! Most days are strenuously paced with 2–8 miles of walking, including hilly terrain and lots of stairs.